Acupuncture[a] is a form of alternative medicine in which thin needles are inserted into the body. It is a key component of traditional Chinese medicine (TCM). Acupuncture is a pseudoscience because the theories and practices of TCM are not based on scientific knowledge. There is a diverse range of acupuncture variants originating in different philosophies, and techniques vary depending on the country in which it is performed. The method of acupuncture codified under Mao Zedong and used in TCM is probably the most widespread in the United States. It is most often used to attempt pain relief, though it is also recommended by acupuncturists for a wide range of other conditions. Acupuncture is generally used only in combination with other forms of treatment. The conclusions of numerous trials and systematic reviews of acupuncture are largely inconsistent, which suggests that it is not effective. An overview of Cochrane reviews found that acupuncture is not effective for a wide range of conditions. A systematic review conducted by medical scientists at the Universities of Exeter and Plymouth found little evidence of acupuncture’s effectiveness in treating pain. Overall, the evidence suggests that short-term treatment with acupuncture does not produce long-term benefits. Some research results suggest that acupuncture can alleviate some forms of pain, though the majority of research suggests that acupuncture’s apparent effects are not caused by the treatment itself. A systematic review concluded that the analgesic effect of acupuncture seemed to lack clinical relevance and could not be clearly distinguished from bias. One meta-analysis found that acupuncture for chronic low back pain was cost-effective as an adjunct to standard care, while a separate systematic review found insufficient evidence for the cost-effectiveness of acupuncture in the treatment of chronic low back pain. Acupuncture is generally safe when done by appropriately trained practitioners using clean needle technique and single-use needles. When properly delivered, it has a low rate of mostly minor adverse effects. Accidents and infections do occur, though, and are associated with neglect on the part of the practitioner, particularly in the application of sterile techniques. A review conducted in 2013 stated that reports of infection transmission increased significantly in the preceding decade. The most frequently reported adverse events were pneumothorax and infections. Since serious adverse events continue to be reported, it is recommended that acupuncturists be trained sufficiently to reduce the risk. Scientific investigation has not found any histological or physiological evidence for traditional Chinese concepts such as qi, meridians, and acupuncture points,[n 1] and many modern practitioners no longer support the existence of life force energy (qi) flowing through meridians, which was a major part of early belief systems. Acupuncture is believed to have originated around 100 BC in China, around the time The Yellow Emperor’s Classic of Internal Medicine (Huangdi Neijing) was published, though some experts suggest it could have been practiced earlier. Over time, conflicting claims and belief systems emerged about the effect of lunar, celestial and earthly cycles, yin and yang energies, and a body’s “rhythm” on the effectiveness of treatment. Acupuncture fluctuated in popularity in China due to changes in the country’s political leadership and the preferential use of rationalism or Western medicine. Acupuncture spread first to Korea in the 6th century AD, then to Japan through medical missionaries, and then to Europe, beginning with France. In the 20th century, as it spread to the United States and Western countries, spiritual elements of acupuncture that conflict with Western beliefs were sometimes abandoned in favor of simply tapping needles into acupuncture points. Acupuncture is a form of alternative medicine. It is used most commonly for pain relief, though it is also used to treat a wide range of conditions. Acupuncture is generally only used in combination with other forms of treatment. For example, American Society of Anesthesiologists states it may be considered in the treatment for nonspecific, noninflammatory low back pain only in conjunction with conventional therapy. Acupuncture is the insertion of thin needles into the skin. According to the Mayo Foundation for Medical Education and Research (Mayo Clinic), a typical session entails lying still while approximately five to twenty needles are inserted; for the majority of cases, the needles will be left in place for ten to twenty minutes. It can be associated with the application of heat, pressure, or laser light. Classically, acupuncture is individualized and based on philosophy and intuition, and not on scientific research. There is also a non-invasive therapy developed in early 20th century Japan using an elaborate set of “needles” for the treatment of children (shōnishin or shōnihari). Clinical practice varies depending on the country. A comparison of the average number of patients treated per hour found significant differences between China (10) and the United States (1.2). Chinese herbs are often used. There is a diverse range of acupuncture approaches, involving different philosophies. Although various different techniques of acupuncture practice have emerged, the method used in traditional Chinese medicine (TCM) seems to be the most widely adopted in the US. Traditional acupuncture involves needle insertion, moxibustion, and cupping therapy, and may be accompanied by other procedures such as feeling the pulse and other parts of the body and examining the tongue. Traditional acupuncture involves the belief that a “life force” (qi) circulates within the body in lines called meridians. The main methods practiced in the UK are TCM and Western medical acupuncture. The term Western medical acupuncture is used to indicate an adaptation of TCM-based acupuncture which focuses less on TCM. The Western medical acupuncture approach involves using acupuncture after a medical diagnosis. Limited research has compared the contrasting acupuncture systems used in various countries for determining different acupuncture points and thus there is no defined standard for acupuncture points. In traditional acupuncture, the acupuncturist decides which points to treat by observing and questioning the patient to make a diagnosis according to the tradition used. In TCM, the four diagnostic methods are: inspection, auscultation and olfaction, inquiring, and palpation. Inspection focuses on the face and particularly on the tongue, including analysis of the tongue size, shape, tension, color and coating, and the absence or presence of teeth marks around the edge. Auscultation and olfaction involve listening for particular sounds such as wheezing, and observing body odor. Inquiring involves focusing on the “seven inquiries”: chills and fever; perspiration; appetite, thirst and taste; defecation and urination; pain; sleep; and menses and leukorrhea. Palpation is focusing on feeling the body for tender “A-shi” points and feeling the pulse. The skin is sterilized and needles are inserted, frequently with a plastic guide tube. Needles may be manipulated in various ways, including spinning, flicking, or moving up and down relative to the skin. Since most pain is felt in the superficial layers of the skin, a quick insertion of the needle is recommended. Often the needles are stimulated by hand in order to cause a dull, localized, aching sensation that is called de qi, as well as “needle grasp,” a tugging feeling felt by the acupuncturist and generated by a mechanical interaction between the needle and skin. Acupuncture can be painful. The skill level of the acupuncturist may influence how painful the needle insertion is, and a sufficiently skilled practitioner may be able to insert the needles without causing any pain. De-qi (Chinese: 得气; pinyin: dé qì; “arrival of qi”) refers to a sensation of numbness, distension, or electrical tingling at the needling site which might radiate along the corresponding meridian. If de-qi can not be generated, then inaccurate location of the acupoint, improper depth of needle insertion, inadequate manual manipulation, or a very weak constitution of the patient can be considered, all of which are thought to decrease the likelihood of successful treatment. If the de-qi sensation does not immediately occur upon needle insertion, various manual manipulation techniques can be applied to promote it (such as “plucking”, “shaking” or “trembling”). Once de-qi is achieved, further techniques might be utilized which aim to “influence” the de-qi; for example, by certain manipulation the de-qi sensation allegedly can be conducted from the needling site towards more distant sites of the body. Other techniques aim at “tonifying” (Chinese: 补; pinyin: bǔ) or “sedating” (Chinese: 泄; pinyin: xiè) qi. The former techniques are used in deficiency patterns, the latter in excess patterns. De qi is more important in Chinese acupuncture, while Western and Japanese patients may not consider it a necessary part of the treatment. Electroacupuncture is a form of acupuncture in which acupuncture needles are attached to a device that generates continuous electric pulses (this has been described as “essentially transdermal electrical nerve stimulation [TENS] masquerading as acupuncture”). Acupuncture point injection is the injection of various substances (such as drugs, vitamins or herbal extracts) into acupoints. This technique combines traditional acupuncture with injection of what is often an effective dose of an approved pharmaceutical drug, and proponents claim that it may be more effective than either treatment alone, especially for the treatment of some kinds of chronic pain. However, a 2016 review found that most published trials of the technique were of poor value due to methodology issues and larger trials would be needed to draw useful conclusions. Veterinary acupuncture is the use of acupuncture on domesticated animals. Rigorous evidence for complementary and alternative techniques is lacking in veterinary medicine but evidence has been growing. Acupuncture has been researched extensively; as of 2013, there were almost 1,500 randomized controlled trials on PubMed with “acupuncture” in the title. The results of reviews of acupuncture’s efficacy, however, have been inconclusive. It is difficult but not impossible to design rigorous research trials for acupuncture. Due to acupuncture’s invasive nature, one of the major challenges in efficacy research is in the design of an appropriate placebo control group. For efficacy studies to determine whether acupuncture has specific effects, “sham” forms of acupuncture where the patient, practitioner, and analyst are blinded seem the most acceptable approach. Sham acupuncture uses non-penetrating needles or needling at non-acupuncture points, e.g. inserting needles on meridians not related to the specific condition being studied, or in places not associated with meridians. The under-performance of acupuncture in such trials may indicate that therapeutic effects are due entirely to non-specific effects, or that the sham treatments are not inert, or that systematic protocols yield less than optimal treatment. A 2014 review in Nature Reviews Cancer found that “contrary to the claimed mechanism of redirecting the flow of qi through meridians, researchers usually find that it generally does not matter where the needles are inserted, how often (that is, no dose-response effect is observed), or even if needles are actually inserted. In other words, ‘sham’ or ‘placebo’ acupuncture generally produces the same effects as ‘real’ acupuncture and, in some cases, does better.” A 2013 meta-analysis found little evidence that the effectiveness of acupuncture on pain (compared to sham) was modified by the location of the needles, the number of needles used, the experience or technique of the practitioner, or by the circumstances of the sessions. The same analysis also suggested that the number of needles and sessions is important, as greater numbers improved the outcomes of acupuncture compared to non-acupuncture controls. There has been little systematic investigation of which components of an acupuncture session may be important for any therapeutic effect, including needle placement and depth, type and intensity of stimulation, and number of needles used. The research seems to suggest that needles do not need to stimulate the traditionally specified acupuncture points or penetrate the skin to attain an anticipated effect (e.g. psychosocial factors). A response to “sham” acupuncture in osteoarthritis may be used in the elderly, but placebos have usually been regarded as deception and thus unethical. However, some physicians and ethicists have suggested circumstances for applicable uses for placebos such as it might present a theoretical advantage of an inexpensive treatment without adverse reactions or interactions with drugs or other medications. As the evidence for most types of alternative medicine such as acupuncture is far from strong, the use of alternative medicine in regular healthcare can present an ethical question. Using the principles of evidence-based medicine to research acupuncture is controversial, and has produced different results. Some research suggests acupuncture can alleviate pain but the majority of research suggests that acupuncture’s effects are mainly due to placebo. Evidence suggests that any benefits of acupuncture are short-lasting. There is insufficient evidence to support use of acupuncture compared to mainstream medical treatments. Acupuncture is not better than mainstream treatment in the long term. The use of acupuncture has been criticized owing to there being little scientific evidence for explicit effects, or the mechanisms for its supposed effectiveness, for any condition that is discernible from placebo. Acupuncture has been called ‘theatrical placebo’, and David Gorski argues that when acupuncture proponents advocate ‘harnessing of placebo effects’ or work on developing ‘meaningful placebos’, they essentially concede it is little more than that. Publication bias is cited as a concern in the reviews of randomized controlled trials (RCTs) of acupuncture. A 1998 review of studies on acupuncture found that trials originating in China, Japan, Hong Kong, and Taiwan were uniformly favourable to acupuncture, as were ten out of eleven studies conducted in Russia. A 2011 assessment of the quality of RCTs on TCM, including acupuncture, concluded that the methodological quality of most such trials (including randomization, experimental control, and blinding) was generally poor, particularly for trials published in Chinese journals (though the quality of acupuncture trials was better than the trials testing TCM remedies). The study also found that trials published in non-Chinese journals tended to be of higher quality. Chinese authors use more Chinese studies, which have been demonstrated to be uniformly positive. A 2012 review of 88 systematic reviews of acupuncture published in Chinese journals found that less than half of these reviews reported testing for publication bias, and that the majority of these reviews were published in journals with impact factors of zero. A 2015 study comparing pre-registered records of acupuncture trials with their published results found that it was uncommon for such trials to be registered before the trial began. This study also found that selective reporting of results and changing outcome measures to obtain statistically significant results was common in this literature. Scientist and journalist Steven Salzberg identifies acupuncture and Chinese medicine generally as a focus for “fake medical journals” such as the Journal of Acupuncture and Meridian Studies and Acupuncture in Medicine. A 2014 systematic review suggests that the nocebo effect of acupuncture is clinically relevant and that the rate of adverse events may be a gauge of the nocebo effect. According to the 2014 Miller’s Anesthesia book, “when compared with placebo, acupuncture treatment has proven efficacy for relieving pain”. A 2012 meta-analysis conducted by the Acupuncture Trialists’ Collaboration found “relatively modest” efficacy of acupuncture (in comparison to sham) for the treatment of four different types of chronic pain (back and neck pain, knee osteoarthritis, chronic headache, and shoulder pain) and on that basis concluded that it “is more than a placebo” and a reasonable referral option. Commenting on this meta-analysis, both Edzard Ernst and David Colquhoun said the results were of negligible clinical significance. Edzard Ernst later stated that “I fear that, once we manage to eliminate this bias [that operators are not blind] … we might find that the effects of acupuncture exclusively are a placebo response.” In 2017, the same research group updated their previous meta-analysis and again found acupuncture to be superior to sham acupuncture for non-specific musculoskeletal pain, osteoarthritis, chronic headache, and shoulder pain. They also found that the effects of acupuncture decreased by about 15% after one year. A 2010 systematic review suggested that acupuncture is more than a placebo for commonly occurring chronic pain conditions, but the authors acknowledged that it is still unknown if the overall benefit is clinically meaningful or cost-effective. A 2010 review found real acupuncture and sham acupuncture produce similar improvements, which can only be accepted as evidence against the efficacy of acupuncture. The same review found limited evidence that real acupuncture and sham acupuncture appear to produce biological differences despite similar effects. A 2009 systematic review and meta-analysis found that acupuncture had a small analgesic effect, which appeared to lack any clinical importance and could not be discerned from bias. The same review found that it remains unclear whether acupuncture reduces pain independent of a psychological impact of the needling ritual. A 2017 systematic review and meta-analysis found that ear acupuncture may be effective at reducing pain within 48 hours of its use, but the mean difference between the acupuncture and control groups was small. A 2013 systematic review found that acupuncture may be effective for nonspecific lower back pain, but the authors noted there were limitations in the studies examined, such as heterogeneity in study characteristics and low methodological quality in many studies. A 2012 systematic review found some supporting evidence that acupuncture was more effective than no treatment for chronic non-specific low back pain; the evidence was conflicting comparing the effectiveness over other treatment approaches. A 2011 systematic review of systematic reviews found that “for chronic low back pain, individualized acupuncture is not better in reducing symptoms than formula acupuncture or sham acupuncture with a toothpick that does not penetrate the skin.” A 2010 review found that sham acupuncture was as effective as real acupuncture for chronic low back pain. The specific therapeutic effects of acupuncture were small, whereas its clinically relevant benefits were mostly due to contextual and psychosocial circumstances. Brain imaging studies have shown that traditional acupuncture and sham acupuncture differ in their effect on limbic structures, while at the same time showed equivalent analgesic effects. A 2005 Cochrane review found insufficient evidence to recommend for or against either acupuncture or dry needling for acute low back pain. The same review found low quality evidence for pain relief and improvement compared to no treatment or sham therapy for chronic low back pain only in the short term immediately after treatment. The same review also found that acupuncture is not more effective than conventional therapy and other alternative medicine treatments. A 2017 systematic review and meta-analysis concluded that, for neck pain, acupuncture was comparable in effectiveness to conventional treatment, while electroacupuncture was even more effective in reducing pain than was conventional acupuncture. The same review noted that “It is difficult to draw conclusion [sic] because the included studies have a high risk of bias and imprecision.” A 2015 overview of systematic reviews of variable quality showed that acupuncture can provide short-term improvements to people with chronic Low Back Pain. The overview said this was true when acupuncture was used either in isolation or in addition to conventional therapy. A 2017 systematic review for an American College of Physicians clinical practice guideline found low to moderate evidence that acupuncture was effective for chronic low back pain, and limited evidence that it was effective for acute low back pain. The same review found that the strength of the evidence for both conditions was low to moderate. Another 2017 clinical practice guideline, this one produced by the Danish Health Authority, recommended against acupuncture for both recent-onset low back pain and lumbar radiculopathy. A 2014 review concluded that “current evidence supports the use of acupuncture as an alternative to traditional analgesics in osteoarthritis patients.” As of 2014[update], a meta-analysis showed that acupuncture may help osteoarthritis pain but it was noted that the effects were insignificant in comparison to sham needles. A 2013 systematic review and network meta-analysis found that the evidence suggests that acupuncture may be considered one of the more effective physical treatments for alleviating pain due to knee osteoarthritis in the short-term compared to other relevant physical treatments, though much of the evidence in the topic is of poor quality and there is uncertainty about the efficacy of many of the treatments. A 2012 review found “the potential beneficial action of acupuncture on osteoarthritis pain does not appear to be clinically relevant.” A 2010 Cochrane review found that acupuncture shows statistically significant benefit over sham acupuncture in the treatment of peripheral joint osteoarthritis; however, these benefits were found to be so small that their clinical significance was doubtful, and “probably due at least partially to placebo effects from incomplete blinding”. A 2013 Cochrane review found low to moderate evidence that acupuncture improves pain and stiffness in treating people with fibromyalgia compared with no treatment and standard care. A 2012 review found “there is insufficient evidence to recommend acupuncture for the treatment of fibromyalgia.” A 2010 systematic review found a small pain relief effect that was not apparently discernible from bias; acupuncture is not a recommendable treatment for the management of fibromyalgia on the basis of this review. A 2012 review found that the effectiveness of acupuncture to treat rheumatoid arthritis is “sparse and inconclusive.” A 2005 Cochrane review concluded that acupuncture use to treat rheumatoid arthritis “has no effect on ESR, CRP, pain, patient’s global assessment, number of swollen joints, number of tender joints, general health, disease activity and reduction of analgesics.” A 2010 overview of systematic reviews found insufficient evidence to recommend acupuncture in the treatment of most rheumatic conditions, with the exceptions of osteoarthritis, low back pain, and lateral elbow pain. A 2018 systematic review found some evidence that acupuncture could be effective for the treatment of rheumatoid arthritis, but that the evidence was limited because of heterogeneity and methodological flaws in the included studies. A 2014 systematic review found that although manual acupuncture was effective at relieving short-term pain when used to treat tennis elbow, its long-term effect in relieving pain was “unremarkable”. A 2007 review found that acupuncture was significantly better than sham acupuncture at treating chronic knee pain; the evidence was not conclusive due to the lack of large, high-quality trials. A 2014 overview of systematic reviews found insufficient evidence to suggest that acupuncture is an effective treatment for postoperative nausea and vomiting (PONV) in a clinical setting. A 2013 systematic review concluded that acupuncture might be beneficial in prevention and treatment of PONV. A 2015 Cochrane review found moderate-quality evidence of no difference between stimulation of the P6 acupoint on the wrist and antiemetic drugs for preventing PONV. A new finding of the review was that further comparative trials are futile, based on the conclusions of a trial sequential analysis. Whether combining PC6 acupoint stimulation with antiemetics is effective was inconclusive. A 2011 systematic review of systematic reviews (internationally and without language restrictions) found that serious complications following acupuncture continue to be reported. Between 2000 and 2009, ninety-five cases of serious adverse events, including five deaths, were reported. Many such events are not inherent to acupuncture but are due to malpractice of acupuncturists. This might be why such complications have not been reported in surveys of adequately trained acupuncturists. Most such reports originate from Asia, which may reflect the large number of treatments performed there or a relatively higher number of poorly trained Asian acupuncturists. Many serious adverse events were reported from developed countries. These included Australia, Austria, Canada, Croatia, France, Germany, Ireland, the Netherlands, New Zealand, Spain, Sweden, Switzerland, the UK, and the US. The number of adverse effects reported from the UK appears particularly unusual, which may indicate less under-reporting in the UK than other countries. Reports included 38 cases of infections and 42 cases of organ trauma. The most frequent adverse events included pneumothorax, and bacterial and viral infections. A 2013 review found (without restrictions regarding publication date, study type or language) 295 cases of infections; mycobacterium was the pathogen in at least 96%. Likely sources of infection include towels, hot packs or boiling tank water, and reusing reprocessed needles. Possible sources of infection include contaminated needles, reusing personal needles, a person’s skin containing mycobacterium, and reusing needles at various sites in the same person. Although acupuncture is generally considered a safe procedure, a 2013 review stated that the reports of infection transmission increased significantly in the prior decade, including those of mycobacterium. Although it is recommended that practitioners of acupuncture use disposable needles, the reuse of sterilized needles is still permitted. It is also recommended that thorough control practices for preventing infection be implemented and adapted. A 2012 review found a number of adverse events were reported after acupuncture in the UK’s National Health Service (NHS) but most (95%) were not severe, though miscategorization and under-reporting may alter the total figures. From January 2009 to December 2011, 468 safety incidents were recognized within the NHS organizations. The adverse events recorded included retained needles (31%), dizziness (30%), loss of consciousness/unresponsive (19%), falls (4%), bruising or soreness at needle site (2%), pneumothorax (1%) and other adverse side effects (12%). Acupuncture practitioners should know, and be prepared to be responsible for, any substantial harm from treatments. Some acupuncture proponents argue that the long history of acupuncture suggests it is safe. However, there is an increasing literature on adverse events (e.g. spinal-cord injury). In 2008 a study determined that the use of acupuncture-needle treatment on children was “questionable” due to the possibility of adverse side-effects and the pain manifestation differences in children versus adults. The study also includes warnings against practicing acupuncture on infants, as well as on children who are over-fatigued, very weak, or have over-eaten. When used during pregnancy, the majority of adverse events caused by acupuncture were mild and transient, with few serious adverse events. The most frequent mild adverse event was needling or unspecified pain, followed by bleeding. Although two deaths (one stillbirth and one neonatal death) were reported, there was a lack of acupuncture-associated maternal mortality. Limiting the evidence as certain, probable or possible in the causality evaluation, the estimated incidence of adverse events following acupuncture in pregnant women was 131 per 10,000. Although acupuncture is not contraindicated in pregnant women, some specific acupuncture points are particularly sensitive to needle insertion; these spots, as well as the abdominal region, should be avoided during pregnancy. As with other alternative medicines, unethical or naïve practitioners may induce patients to exhaust financial resources by pursuing ineffective treatment. Professional ethics codes set by accrediting organizations such as the National Certification Commission for Acupuncture and Oriental Medicine require practitioners to make “timely referrals to other health care professionals as may be appropriate.” Stephen Barrett states that there is a “risk that an acupuncturist whose approach to diagnosis is not based on scientific concepts will fail to diagnose a dangerous condition”. Acupuncture is a substantial part of traditional Chinese medicine (TCM). Early acupuncture beliefs relied on concepts that are common in TCM, such as a life force energy called qi. 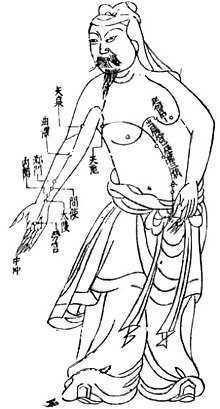 Qi was believed to flow from the body’s primary organs (zang-fu organs) to the “superficial” body tissues of the skin, muscles, tendons, bones, and joints, through channels called meridians. Acupuncture points where needles are inserted are mainly (but not always) found at locations along the meridians. Acupuncture points not found along a meridian are called extraordinary points and those with no designated site are called “A-shi” points. In TCM, disease is generally perceived as a disharmony or imbalance in energies such as yin, yang, qi, xuĕ, zàng-fǔ, meridians, and of the interaction between the body and the environment. Therapy is based on which “pattern of disharmony” can be identified. For example, some diseases are believed to be caused by meridians being invaded with an excess of wind, cold, and damp. In order to determine which pattern is at hand, practitioners examine things like the color and shape of the tongue, the relative strength of pulse-points, the smell of the breath, the quality of breathing, or the sound of the voice. TCM and its concept of disease does not strongly differentiate between the cause and effect of symptoms. Some modern practitioners support the use of acupuncture to treat pain, but have abandoned the use of qi, meridians, yin, yang and other energies based in mysticism as explanatory frameworks. The use of qi as an explanatory framework has been decreasing in China, even as it becomes more prominent during discussions of acupuncture in the US. Academic discussions of acupuncture still make reference to pseudoscientific concepts such as qi and meridians despite the lack of scientific evidence. 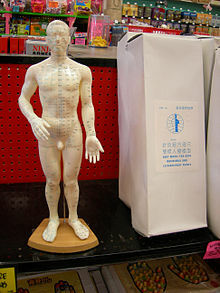 Many within the scientific community consider attempts to rationalize acupuncture in science to be quackery, pseudoscience and “theatrical placebo”. Academics Massimo Pigliucci and Maarten Boudry describe it as a “borderlands science” lying between science and pseudoscience. It has been proposed that acupuncture’s effects in gastrointestinal disorders may relate to its effects on the parasympathetic and sympathetic nervous system, which have been said to be the “Western medicine” equivalent of “yin and yang”. Another mechanism whereby acupuncture may be effective for gastrointestinal dysfunction involves the promotion of gastric peristalsis in subjects with low initial gastric motility, and suppressing peristalsis in subjects with active initial motility. Acupuncture has also been found to exert anti-inflammatory effects, which may be mediated by the activation of the vagus nerve and deactivation of inflammatory macrophages. Neuroimaging studies suggest that acupuncture stimulation results in deactivation of the limbic brain areas and the default mode network. 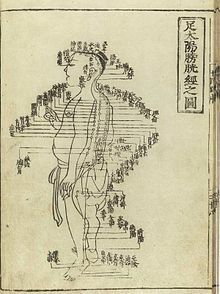 According to an article in Rheumatology, the first documentation of an “organized system of diagnosis and treatment” for acupuncture was in The Yellow Emperor’s Classic of Internal Medicine (Huangdi Neijing) from about 100 BC. Gold and silver needles found in the tomb of Liu Sheng from around 100 BC are believed to be the earliest archeological evidence of acupuncture, though it is unclear if that was their purpose. According to Plinio Prioreschi, the earliest known historical record of acupuncture is the Shih-Chi (“Record of History”), written by a historian around 100 BC. It is believed that this text was documenting what was established practice at that time. The 5,000-year-old mummified body of Ötzi the Iceman was found with 15 groups of tattoos, many of which were located at points on the body where acupuncture needles are used for abdominal or lower back problems. Evidence from the body suggests Otzi suffered from these conditions. This has been cited as evidence that practices similar to acupuncture may have been practiced elsewhere in Eurasia during the early Bronze Age; however, The Oxford Handbook of the History of Medicine calls this theory “speculative”. It is considered unlikely that acupuncture was practiced before 2000 BC. The Ötzi the Iceman’s tattoo marks suggest to some experts that an acupuncture-like treatment was previously used in Europe 5 millennia ago. Acupuncture may have been practiced during the Neolithic era, near the end of the stone age, using sharpened stones called Bian shi. :70 Many Chinese texts from later eras refer to sharp stones called “plen”, which means “stone probe”, that may have been used for acupuncture purposes. :70 The ancient Chinese medical text, Huangdi Neijing, indicates that sharp stones were believed at-the-time to cure illnesses at or near the body’s surface, perhaps because of the short depth a stone could penetrate. :71 However, it is more likely that stones were used for other medical purposes, such as puncturing a growth to drain its pus. The Mawangdui texts, which are believed to be from the 2nd century BC, mention the use of pointed stones to open abscesses, and moxibustion, but not for acupuncture. It is also speculated that these stones may have been used for bloodletting, due to the ancient Chinese belief that illnesses were caused by demons within the body that could be killed or released. It is likely bloodletting was an antecedent to acupuncture. According to historians Lu Gwei-djen and Joseph Needham, there is substantial evidence that acupuncture may have begun around 600 BC. Some hieroglyphs and pictographs from that era suggests acupuncture and moxibustion were practiced. However, historians Gwei-djen and Needham said it was unlikely a needle could be made out of the materials available in China during this time period. 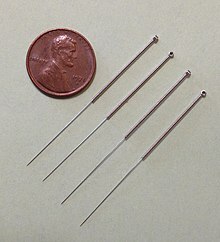 :71-72 It is possible that bronze was used for early acupuncture needles. Tin, copper, gold and silver are also possibilities, though they are considered less likely, or to have been used in fewer cases. :69 If acupuncture was practiced during the Shang dynasty (1766 to 1122 BC), organic materials like thorns, sharpened bones, or bamboo may have been used. :70 Once methods for producing steel were discovered, it would replace all other materials, since it could be used to create a very fine, but sturdy needles. :74 Gwei-djen and Needham noted that all the ancient materials that could have been used for acupuncture and which often produce archeological evidence, such as sharpened bones, bamboo or stones, were also used for other purposes. An article in Rheumatology said that the absence of any mention of acupuncture in documents found in the tomb of Ma-Wang-Dui from 198 BC suggest that acupuncture was not practiced by that time. Several different and sometimes conflicting belief systems emerged regarding acupuncture. This may have been the result of competing schools of thought. Some ancient texts referred to using acupuncture to cause bleeding, while others mixed the ideas of blood-letting and spiritual ch’i energy. Over time, the focus shifted from blood to the concept of puncturing specific points on the body, and eventually to balancing Yin and Yang energies as well. According to David Ramey, no single “method or theory” was ever predominantly adopted as the standard. At the time, scientific knowledge of medicine was not yet developed, especially because in China dissection of the deceased was forbidden, preventing the development of basic anatomical knowledge. It is not certain when specific acupuncture points were introduced, but the autobiography of Pien Chhio from around 400–500 BC references inserting needles at designated areas. Bian Que believed there was a single acupuncture point at the top of one’s skull that he called the point “of the hundred meetings.”:83 Texts dated to be from 156–186 BC document early beliefs in channels of life force energy called meridians that would later be an element in early acupuncture beliefs. In the first half of the 1st century AD, acupuncturists began promoting the belief that acupuncture’s effectiveness was influenced by the time of day or night, the lunar cycle, and the season. :140-141 The Science of the Yin-Yang Cycles (Yün Chhi Hsüeh) was a set of beliefs that curing diseases relied on the alignment of both heavenly (thien) and earthly (ti) forces that were attuned to cycles like that of the sun and moon. :140-141 There were several different belief systems that relied on a number of celestial and earthly bodies or elements that rotated and only became aligned at certain times. :140-141 According to Needham and Gwei-djen, these “arbitrary predictions” were depicted by acupuncturists in complex charts and through a set of special terminology. By the end of the Song dynasty (1279 AD), acupuncture had lost much of its status in China. It became rarer in the following centuries, and was associated with less prestigious professions like alchemy, shamanism, midwifery and moxibustion. Additionally, by the 18th century, scientific rationality was becoming more popular than traditional superstitious beliefs. By 1757 a book documenting the history of Chinese medicine called acupuncture a “lost art”. :160 Its decline was attributed in part to the popularity of prescriptions and medications, as well as its association with the lower classes. Acupuncture began to spread to Europe in the second half of the 17th century. Around this time the surgeon-general of the Dutch East India Company met Japanese and Chinese acupuncture practitioners and later encouraged Europeans to further investigate it. :264-265 He published the first in-depth description of acupuncture for the European audience and created the term “acupuncture” in his 1683 work De Acupunctura. France was an early adopter among the West due to the influence of Jesuit missionaries, who brought the practice to French clinics in the 16th century. The French doctor Louis Berlioz (the father of the composer Hector Berlioz) is usually credited with being the first to experiment with the procedure in Europe in 1810, before publishing his findings in 1816. By the 19th century, acupuncture had become commonplace in many areas of the world. :295 Americans and Britons began showing interest in acupuncture in the early 19th century but interest waned by mid century. Western practitioners abandoned acupuncture’s traditional beliefs in spiritual energy, pulse diagnosis, and the cycles of the moon, sun or the body’s rhythm. Diagrams of the flow of spiritual energy, for example, conflicted with the West’s own anatomical diagrams. It adopted a new set of ideas for acupuncture based on tapping needles into nerves. In Europe it was speculated that acupuncture may allow or prevent the flow of electricity in the body, as electrical pulses were found to make a frog’s leg twitch after death. The West eventually created a belief system based on Travell trigger points that were believed to inhibit pain. They were in the same locations as China’s spiritually identified acupuncture points, but under a different nomenclature. The first elaborate Western treatise on acupuncture was published in 1683 by Willem ten Rhijne. Politicians from the Chinese Communist Party said acupuncture was superstitious and conflicted with the party’s commitment to science. Communist Party Chairman Mao Zedong later reversed this position, arguing that the practice was based on scientific principles. In 2010, UNESCO inscribed “acupuncture and moxibustion of traditional Chinese medicine” on the UNESCO Intangible Cultural Heritage List following China’s nomination. Acupuncture is most heavily practiced in China and is popular in the US, Australia, and Europe. In Switzerland, acupuncture has become the most frequently used alternative medicine since 2004. In the United Kingdom, a total of 4 million acupuncture treatments were administered in 2009. Acupuncture is used in most pain clinics and hospices in the UK. An estimated 1 in 10 adults in Australia used acupuncture in 2004. In Japan, it is estimated that 25 percent of the population will try acupuncture at some point, though in most cases it is not covered by public health insurance. Users of acupuncture in Japan are more likely to be elderly and to have a limited education. Approximately half of users surveyed indicated a likelihood to seek such remedies in the future, while 37% did not. Less than one percent of the US population reported having used acupuncture in the early 1990s. By the early 2010s, more than 14 million Americans reported having used acupuncture as part of their health care. In the US, acupuncture is increasingly (as of 2014[update]) used at academic medical centers, and is usually offered through CAM centers or anesthesia and pain management services. Examples include those at Harvard University, Stanford University, Johns Hopkins University, and UCLA. In Japan, acupuncturists are licensed by the Minister of Health, Labour and Welfare after passing an examination and graduating from a technical school or university. Australia regulates Chinese medical traditions through the Chinese Medicine Board of Australia and the Public Health (Skin Penetration) Regulation of 2000. It restricts the use of words like “Acupuncture” and “Registered Acupuncturist”. At least 28 countries in Europe have professional associations for acupuncturists. In France, the Académie Nationale de Médecine (National Academy of Medicine) has regulated acupuncture since 1955. Aung S, Chen W (2007). Clinical Introduction to Medical Acupuncture. Thieme Medical Publishers. ISBN 9781588902214. Barnes, LL (2005). Needles, Herbs, Gods, and Ghosts: China, Healing, and the West to 1848. Harvard University Press. ISBN 978-0674018723. Cheng, X (1987). Chinese Acupuncture and Moxibustion (1st ed.). Foreign Languages Press. ISBN 978-7119003788. Needham J, Lu GD (2002). Celestial Lancets: A History and Rationale of Acupuncture and Moxa. Routledge. ISBN 978-0700714582. Singh S, Ernst E (2008). Trick or Treatment: Alternative Medicine on Trial. London: Bantam. ISBN 9780593061299. Madsen MV, Gøtzsche PC, Hróbjartsson A (January 2009). “Acupuncture treatment for pain: systematic review of randomised clinical trials with acupuncture, placebo acupuncture, and no acupuncture groups”. BMJ. 338: a3115. doi:10.1136/bmj.a3115. PMC 2769056. PMID 19174438. Wiseman N, Ellis A (1996). Fundamentals of Chinese medicine. Paradigm Publications. ISBN 9780912111445. ^ a b c Singh & Ernst (2008) stated, “Scientists are still unable to find a shred of evidence to support the existence of meridians or Ch’i”, “The traditional principles of acupuncture are deeply flawed, as there is no evidence at all to demonstrate the existence of Ch’i or meridians” and “As yin and yang, acupuncture points and meridians are not a reality, but merely the product of an ancient Chinese philosophy”. ^ The word “needle” can be written with either of the two characters 針 or 鍼 in traditional contexts. ^ Pyne D, Shenker NG (August 2008). “Demystifying acupuncture”. Rheumatology. 47 (8): 1132–6. doi:10.1093/rheumatology/ken161. PMID 18460551. ^ a b c d e f g h i j k l m n o p Berman BM, Langevin HM, Witt CM, Dubner R (July 2010). “Acupuncture for chronic low back pain”. The New England Journal of Medicine. 363 (5): 454–61. doi:10.1056/NEJMct0806114. PMID 20818865. ^ a b c d e f g h i j Adams D, Cheng F, Jou H, Aung S, Yasui Y, Vohra S (December 2011). “The safety of pediatric acupuncture: a systematic review”. Pediatrics. 128 (6): e1575–87. doi:10.1542/peds.2011-1091. PMID 22106073. ^ Baran GR, Kiana MF, Samuel SP (2014). Chapter 2: Science, Pseudoscience, and Not Science: How Do They Differ?. Healthcare and Biomedical Technology in the 21st Century. Springer. pp. 19–57. doi:10.1007/978-1-4614-8541-4_2. ISBN 978-1-4614-8540-7. various pseudosciences maintain their popularity in our society: acupuncture, astrology, homeopathy, etc. ^ Good R (2012). Khine MS (ed.). Chapter 5: Why the Study of Pseudoscience Should Be Included in Nature of Science Studies. Advances in Nature of Science Research: Concepts and Methodologies. Springer. p. 103. ISBN 978-94-007-2457-0. Believing in something like chiropractic or acupuncture really can help relieve pain to a small degree […] but many related claims of medical cures by these pseudosciences are bogus. ^ a b c Barrett, S (30 December 2007). “Be Wary of Acupuncture, Qigong, and “Chinese Medicine““. Quackwatch. Retrieved 4 May 2015. ^ a b c d de las Peñas CF, Arendt-Nielsen L, Gerwin RD (2010). Tension-type and cervicogenic headache: pathophysiology, diagnosis, and management. Jones & Bartlett Learning. pp. 251–254. ISBN 9780763752835. ^ a b c d e f Ernst E (February 2006). “Acupuncture–a critical analysis”. Journal of Internal Medicine. 259 (2): 125–37. doi:10.1111/j.1365-2796.2005.01584.x. PMID 16420542. ^ “In the tradition of Chairman Mao, traditional Chinese medicine gets a new boost by the Chinese government”. sciencebasedmedicine.org. Retrieved 7 March 2019. ^ a b c d e f g h i j k l m n o p q r s t u Ernst E, Lee MS, Choi TY (April 2011). “Acupuncture: does it alleviate pain and are there serious risks? A review of reviews” (PDF). Pain. 152 (4): 755–64. doi:10.1016/j.pain.2010.11.004. PMID 21440191. ^ a b “Acupuncture for Pain”. NCCIH. January 2008. Retrieved 9 May 2014. ^ a b c Hutchinson AJ, Ball S, Andrews JC, Jones GG (October 2012). “The effectiveness of acupuncture in treating chronic non-specific low back pain: a systematic review of the literature”. Journal of Orthopaedic Surgery and Research. 7 (1): 36. doi:10.1186/1749-799X-7-36. PMC 3563482. PMID 23111099. ^ a b c d Ernst E (April 2009). “Acupuncture: what does the most reliable evidence tell us?”. Journal of Pain and Symptom Management. 37 (4): 709–14. doi:10.1016/j.jpainsymman.2008.04.009. PMID 18789644. ^ a b Wang SM, Kain ZN, White PF (February 2008). “Acupuncture analgesia: II. Clinical considerations”. Anesthesia and Analgesia. 106 (2): 611–21, table of contents. doi:10.1213/ane.0b013e318160644d. PMID 18227323. ^ a b c Madsen MV, Gøtzsche PC, Hróbjartsson A (January 2009). “Acupuncture treatment for pain: systematic review of randomised clinical trials with acupuncture, placebo acupuncture, and no acupuncture groups”. BMJ. 338: a3115. doi:10.1136/bmj.a3115. PMC 2769056. PMID 19174438. ^ a b c Taylor P, Pezzullo L, Grant SJ, Bensoussan A (September 2014). “Cost-effectiveness of Acupuncture for Chronic Nonspecific Low Back Pain”. Pain Practice. 14 (7): 599–606. doi:10.1111/papr.12116. PMID 24138020. ^ a b Standaert CJ, Friedly J, Erwin MW, Lee MJ, Rechtine G, Henrikson NB, Norvell DC (October 2011). “Comparative effectiveness of exercise, acupuncture, and spinal manipulation for low back pain”. Spine. 36 (21 Suppl): S120–30. doi:10.1097/BRS.0b013e31822ef878. PMID 21952184. ^ a b c d e f g h i j k l m n o p q r Xu S, Wang L, Cooper E, Zhang M, Manheimer E, Berman B, Shen X, Lao L (2013). “Adverse events of acupuncture: a systematic review of case reports”. Evidence-Based Complementary and Alternative Medicine. 2013: 1–15. doi:10.1155/2013/581203. PMC 3616356. PMID 23573135. ^ a b c d “Acupuncture–for health professionals (PDQ)”. National Cancer Institute. 23 September 2005. Retrieved 16 July 2015. ^ a b c d e f g Gnatta JR, Kurebayashi LF, Paes da Silva MJ (February 2013). “Atypical mycobacterias associated to acupuncuture: an integrative review”. Revista Latino-Americana de Enfermagem. 21 (1): 450–8. doi:10.1590/s0104-11692013000100022. PMID 23546331. ^ a b c d Ahn AC, Colbert AP, Anderson BJ, Martinsen OG, Hammerschlag R, Cina S, Wayne PM, Langevin HM (May 2008). “Electrical properties of acupuncture points and meridians: a systematic review” (PDF). Bioelectromagnetics. 29 (4): 245–56. doi:10.1002/bem.20403. PMID 18240287. ^ a b c Mann, F (2000). Reinventing Acupuncture: A New Concept of Ancient Medicine. Elsevier. ISBN 978-0750648578. ^ a b c Williams, WF (2013). Encyclopedia of Pseudoscience: From Alien Abductions to Zone Therapy. Encyclopedia of Pseudoscience. Routledge. pp. 3–4. ISBN 978-1135955229. ^ a b c d e f g h i j k l m n o p q r s t u v w White A, Ernst E (May 2004). “A brief history of acupuncture”. Rheumatology. 43 (5): 662–3. doi:10.1093/rheumatology/keg005. PMID 15103027. ^ a b c d e Prioreschi, P (2004). A history of Medicine, Volume 2. Horatius Press. pp. 147–148. ISBN 978-1888456011. ^ a b c d e f g h i j k l m n o p q r s t u v w x y z aa ab ac ad ae af ag ah ai aj ak al am an Lu G, Needham J (25 October 2002). Celestial Lancets: A History and Rationale of Acupuncture and Moxa. ISBN 978-0700714582. ^ a b c d e f g h i Porter, S.B. (2013). Tidy’s Physiotherapy15: Tidy’s Physiotherapy. Churchill Livingstone. Elsevier. p. 403. ISBN 978-0-7020-4344-4. Retrieved 14 July 2015. ^ a b c Jackson, M. (2011). The Oxford Handbook of the History of Medicine. Oxford Handbooks in History. OUP Oxford. p. 610. ISBN 978-0-19-954649-7. Retrieved 14 July 2015. ^ Benzon HT, Connis RT, De Leon-Casasola OA, Glass DD, Korevaar WC, Cynwyd B, Mekhail NA, Merrill DG, Nickinovich DG, Rathmell JP, Sang CN, Simon DL (April 2010). “Practice guidelines for chronic pain management: an updated report by the American Society of Anesthesiologists Task Force on Chronic Pain Management and the American Society of Regional Anesthesia and Pain Medicine”. Anesthesiology. 112 (4): 810–33. doi:10.1097/ALN.0b013e3181c43103. PMID 20124882. ^ “What you can expect”. Mayo Clinic Staff. Mayo Foundation for Medical Education and Research. January 2012. ^ Schwartz, L (2000). “Evidence-Based Medicine And Traditional Chinese Medicine: Not Mutually Exclusive”. Medical Acupuncture. 12 (1): 38–41. Archived from the original on 21 November 2001. ^ Birch S (2011). Japanese Pediatric Acupuncture. Thieme. ISBN 978-3131500618. ^ Wernicke T (2014). The Art of Non-Invasive Paediatric Acupuncture. Jessica Kingsley Publishers. ISBN 978-1848191600. ^ a b c Young, J (2007). Complementary Medicine For Dummies. John Wiley & Sons. pp. 126–128. ISBN 978-0470519684. ^ Napadow V, Kaptchuk TJ (June 2004). “Patient characteristics for outpatient acupuncture in Beijing, China”. Journal of Alternative and Complementary Medicine. 10 (3): 565–72. doi:10.1089/1075553041323849. PMID 15253864. ^ Sherman KJ, Cherkin DC, Eisenberg DM, Erro J, Hrbek A, Deyo RA (2005). “The practice of acupuncture: who are the providers and what do they do?”. Annals of Family Medicine. 3 (2): 151–8. doi:10.1370/afm.248. PMC 1466855. PMID 15798042. ^ a b c d “Acupuncture”. NHSChoices. Retrieved 2 May 2015. ^ a b c d e f g h Wheway J, Agbabiaka TB, Ernst E (January 2012). “Patient safety incidents from acupuncture treatments: a review of reports to the National Patient Safety Agency”. The International Journal of Risk & Safety in Medicine. 24 (3): 163–9. doi:10.3233/JRS-2012-0569. PMID 22936058. ^ White A, Cummings M, Filshie J (2008). “2”. An Introduction to Western Medical Acupuncture. Churchill Livingstone. p. 7. ISBN 978-0-443-07177-5. ^ a b Miller’s Anesthesia. Elsevier. 2014. p. 1235. ISBN 978-0702052835. ^ a b c d Cheng, 1987, chapter 12. ^ a b c Hicks A (2005). The Acupuncture Handbook: How Acupuncture Works and How It Can Help You (1 ed.). Piatkus Books. p. 41. ISBN 978-0749924720. ^ Collinge WJ (1996). The American Holistic Health Association Complete guide to alternative medicine. New York: Warner Books. ISBN 978-0-446-67258-0. ^ a b Aung & Chen, 2007, p. 116. ^ Ellis A, Wiseman N, Boss K (1991). Fundamentals of Chinese Acupuncture. Paradigm Publications. pp. 2–3. ISBN 978-0912111339. ^ a b Aung & Chen, 2007, p. 113–114. ^ Loyeung BY, Cobbin DM (2013). “Investigating the effects of three needling parameters (manipulation, retention time, and insertion site) on needling sensation and pain profiles: a study of eight deep needling interventions”. Evidence-Based Complementary and Alternative Medicine. 2013: 1–12. doi:10.1155/2013/136763. PMC 3789497. PMID 24159337. ^ a b c Aung S, Chen W (10 January 2007). Clinical Introduction to Medical Acupuncture. Thieme. p. 116. ISBN 9781588902214. Retrieved 20 September 2012. ^ Lee EJ, Frazier SK (October 2011). “The efficacy of acupressure for symptom management: a systematic review”. Journal of Pain and Symptom Management. 42 (4): 589–603. doi:10.1016/j.jpainsymman.2011.01.007. PMC 3154967. PMID 21531533. ^ Needham & Lu, 2002, pp 170–173. ^ Farlex (2012). “Tui na”. Farlex. ^ a b c d Colquhoun D, Novella SP (June 2013). “Acupuncture is theatrical placebo” (PDF). Anesthesia and Analgesia. 116 (6): 1360–3. doi:10.1213/ANE.0b013e31828f2d5e. PMID 23709076. ^ Yan C (January 1997). The Treatment of External Diseases with Acupuncture and Moxibustion. Blue Poppy Enterprises, Inc. pp. 112–. ISBN 978-0-936185-80-4. ^ “Sonopuncture”. Educational Opportunities in Integrative Medicine. The Hunter Press. 2008. p. 34. ISBN 9780977655243. ^ Bhagat (2004). Alternative Therapies. pp. 164–165. ISBN 9788180612206. ^ “Sonopuncture”. American Cancer Society’s Guide to complementary and alternative cancer methods. American Cancer Society. 2000. p. 158. ISBN 9780944235249. ^ “Cancer Dictionary – Acupuncture point injection”. National Cancer Institute. 2 February 2011. Archived from the original on 27 March 2011. Retrieved 4 April 2011. ^ Sha T, Gao LL, Zhang CH, Zheng JG, Meng ZH. An update on acupuncture point injection. QJM: An International Journal of Medicine 2016; 109(10): 639-641. Sha T, Gao LL, Zhang CH, Zheng JG, Meng ZH (October 2016). “An update on acupuncture point injection”. QJM. 109 (10): 639–641. doi:10.1093/qjmed/hcw055. PMID 27083985. ^ a b c Barrett, Stephen. “Auriculotherapy: A Skeptical Look”. Acupuncture Watch. ^ Braverman S (2004). “Medical Acupuncture Review: Safety, Efficacy, And Treatment Practices”. Medical Acupuncture. 15 (3). Archived from the original on 27 March 2005. ^ Isaacs N (13 December 2007). “Hold the Chemicals, Bring on the Needles”. New York Times. Retrieved 23 November 2009. ^ Lim SM, Lee SH (July 2015). “Effectiveness of bee venom acupuncture in alleviating post-stroke shoulder pain: a systematic review and meta-analysis”. Journal of Integrative Medicine. 13 (4): 241–7. doi:10.1016/S2095-4964(15)60178-9. PMID 26165368. ^ Habacher G, Pittler MH, Ernst E (2006). “Effectiveness of acupuncture in veterinary medicine: systematic review”. Journal of Veterinary Internal Medicine. 20 (3): 480–8. doi:10.1111/j.1939-1676.2006.tb02885.x. PMID 16734078. ^ Alvarez L (2015). “Chapter 18: Acupuncture”. In Gaynor JS, Muir III WW (eds.). Handbook of Veterinary Pain Management (3rd edition). Elsevier. ISBN 978-0323089357. ^ Hempel S, Taylor SL, Solloway MR, Miake-Lye IM, Beroes JM, Shanman R, Booth MJ, Siroka AM, Shekelle PG (2014). “Evidence Map of Acupuncture”. VA Evidence-based Synthesis Program Reports. Department of Veterans Affairs. PMID 24575449. ^ a b White AR, Filshie J, Cummings TM (December 2001). “Clinical trials of acupuncture: consensus recommendations for optimal treatment, sham controls and blinding”. Complementary Therapies in Medicine. 9 (4): 237–45. doi:10.1054/ctim.2001.0489. PMID 12184353. ^ Witt CM, Aickin M, Baca T, Cherkin D, Haan MN, Hammerschlag R, Hao JJ, Kaplan GA, Lao L, McKay T, Pierce B, Riley D, Ritenbaugh C, Thorpe K, Tunis S, Weissberg J, Berman BM (September 2012). “Effectiveness Guidance Document (EGD) for acupuncture research – a consensus document for conducting trials”. BMC Complementary and Alternative Medicine. 12 (1): 148. doi:10.1186/1472-6882-12-148. PMC 3495216. PMID 22953730. ^ a b Ernst E, Pittler MH, Wider B, Boddy K (2007). “Acupuncture: its evidence-base is changing”. The American Journal of Chinese Medicine. 35 (1): 21–5. doi:10.1142/S0192415X07004588. PMID 17265547. ^ Johnson MI (June 2006). “The clinical effectiveness of acupuncture for pain relief–you can be certain of uncertainty”. Acupuncture in Medicine. 24 (2): 71–9. doi:10.1136/aim.24.2.71. PMID 16783282. ^ a b c d e Amezaga Urruela M, Suarez-Almazor ME (December 2012). “Acupuncture in the treatment of rheumatic diseases”. Current Rheumatology Reports. 14 (6): 589–97. doi:10.1007/s11926-012-0295-x. PMC 3691014. PMID 23055010. ^ a b Langevin HM, Wayne PM, Macpherson H, Schnyer R, Milley RM, Napadow V, Lao L, Park J, Harris RE, Cohen M, Sherman KJ, Haramati A, Hammerschlag R (2011). “Paradoxes in acupuncture research: strategies for moving forward”. Evidence-Based Complementary and Alternative Medicine. 2011: 1–11. doi:10.1155/2011/180805. PMC 2957136. PMID 20976074. ^ Paterson C, Dieppe P (May 2005). “Characteristic and incidental (placebo) effects in complex interventions such as acupuncture”. BMJ. 330 (7501): 1202–5. doi:10.1136/bmj.330.7501.1202. PMC 558023. PMID 15905259. ^ a b c d e Gorski DH (October 2014). “Integrative oncology: really the best of both worlds?”. Nature Reviews. Cancer. 14 (10): 692–700. doi:10.1038/nrc3822. PMID 25230880. ^ a b MacPherson H, Maschino AC, Lewith G, Foster NE, Witt CM, Witt C, Vickers AJ (2013). Eldabe S (ed.). “Characteristics of acupuncture treatment associated with outcome: an individual patient meta-analysis of 17,922 patients with chronic pain in randomised controlled trials”. PLOS One. 8 (10): e77438. doi:10.1371/journal.pone.0077438. PMC 3795671. PMID 24146995. ^ a b Cherniack EP (April 2010). “Would the elderly be better off if they were given more placebos?”. Geriatrics & Gerontology International. 10 (2): 131–7. doi:10.1111/j.1447-0594.2009.00580.x. PMID 20100289. ^ Posadzki P, Alotaibi A, Ernst E (December 2012). “Prevalence of use of complementary and alternative medicine (CAM) by physicians in the UK: a systematic review of surveys”. Clinical Medicine. 12 (6): 505–12. doi:10.7861/clinmedicine.12-6-505. PMC 5922587. PMID 23342401. ^ Goldman L, Schafer AI (21 April 2015). Goldman-Cecil Medicine: Expert Consult – Online. Elsevier Health Sciences. pp. 98–. ISBN 978-0-323-32285-0. ^ Lee A, Copas JB, Henmi M, Gin T, Chung RC (September 2006). “Publication bias affected the estimate of postoperative nausea in an acupoint stimulation systematic review”. Journal of Clinical Epidemiology. 59 (9): 980–3. doi:10.1016/j.jclinepi.2006.02.003. PMID 16895822. ^ Tang JL, Zhan SY, Ernst E (July 1999). “Review of randomised controlled trials of traditional Chinese medicine”. BMJ. 319 (7203): 160–1. doi:10.1136/bmj.319.7203.160. PMC 28166. PMID 10406751. ^ Vickers A, Goyal N, Harland R, Rees R (April 1998). “Do certain countries produce only positive results? A systematic review of controlled trials”. Controlled Clinical Trials. 19 (2): 159–66. doi:10.1016/S0197-2456(97)00150-5. PMID 9551280. ^ a b He J, Du L, Liu G, Fu J, He X, Yu J, Shang L (May 2011). “Quality assessment of reporting of randomization, allocation concealment, and blinding in traditional Chinese medicine RCTs: a review of 3159 RCTs identified from 260 systematic reviews”. Trials. 12 (1): 122. doi:10.1186/1745-6215-12-122. PMC 3114769. PMID 21569452. ^ Ernst E (February 2012). “Acupuncture: what does the most reliable evidence tell us? An update”. Journal of Pain and Symptom Management. 43 (2): e11–3. doi:10.1016/j.jpainsymman.2011.11.001. PMID 22248792. ^ Ma B, Qi GQ, Lin XT, Wang T, Chen ZM, Yang KH (September 2012). “Epidemiology, quality, and reporting characteristics of systematic reviews of acupuncture interventions published in Chinese journals”. Journal of Alternative and Complementary Medicine. 18 (9): 813–7. doi:10.1089/acm.2011.0274. PMID 22924413. ^ Su CX, Han M, Ren J, Li WY, Yue SJ, Hao YF, Liu JP (January 2015). “Empirical evidence for outcome reporting bias in randomized clinical trials of acupuncture: comparison of registered records and subsequent publications”. Trials. 16 (1): 28. doi:10.1186/s13063-014-0545-5. PMC 4320495. PMID 25626862. ^ Salzberg, Steven. “Fake Medical Journals Are Spreading, And They Are Filled With Bad Science”. ^ Koog YH, Lee JS, Wi H (August 2014). “Clinically meaningful nocebo effect occurs in acupuncture treatment: a systematic review”. Journal of Clinical Epidemiology. 67 (8): 858–69. doi:10.1016/j.jclinepi.2014.02.021. PMID 24780405. ^ Vickers AJ, Cronin AM, Maschino AC, Lewith G, MacPherson H, Foster NE, Sherman KJ, Witt CM, Linde K (October 2012). for the Acupuncture Trialists’ Collaboration. “Acupuncture for chronic pain: individual patient data meta-analysis”. Archives of Internal Medicine. 172 (19): 1444–53. doi:10.1001/archinternmed.2012.3654. PMC 3658605. PMID 22965186. ^ Jha, Alok (10 September 2012). “Acupuncture useful, but overall of little benefit, study shows”. The Guardian. ^ Colquhoun, David (17 September 2012). “Re: Risks of acupuncture range from stray needles to pneumothorax, finds study”. The BMJ. BMJ. ^ Vickers AJ, Maschino AC, Lewith G, MacPherson H, Sherman KJ, Witt CM (March 2013). “Responses to the Acupuncture Trialists’ Collaboration individual patient data meta-analysis”. Acupuncture in Medicine. 31 (1): 98–100. doi:10.1136/acupmed-2013-010312. PMC 3658608. PMID 23449559. ^ Vickers AJ, Vertosick EA, Lewith G, MacPherson H, Foster NE, Sherman KJ, Irnich D, Witt CM, Linde K (May 2018). “Acupuncture for Chronic Pain: Update of an Individual Patient Data Meta-Analysis”. The Journal of Pain. 19 (5): 455–474. doi:10.1016/j.jpain.2017.11.005. PMC 5927830. PMID 29198932. ^ a b Hopton A, MacPherson H (2010). “Acupuncture for chronic pain: is acupuncture more than an effective placebo? A systematic review of pooled data from meta-analyses”. Pain Practice. 10 (2): 94–102. doi:10.1111/j.1533-2500.2009.00337.x. PMID 20070551. ^ a b Enck P, Klosterhalfen S, Zipfel S (October 2010). “Acupuncture, psyche and the placebo response”. Autonomic Neuroscience. 157 (1–2): 68–73. doi:10.1016/j.autneu.2010.03.005. PMID 20359961. ^ Murakami M, Fox L, Dijkers MP (March 2017). “Ear Acupuncture for Immediate Pain Relief-A Systematic Review and Meta-Analysis of Randomized Controlled Trials”. Pain Medicine. 18 (3): 551–564. doi:10.1093/pm/pnw215. PMID 28395101. ^ Lam M, Galvin R, Curry P (November 2013). “Effectiveness of acupuncture for nonspecific chronic low back pain: a systematic review and meta-analysis”. Spine. 38 (24): 2124–38. doi:10.1097/01.brs.0000435025.65564.b7. PMID 24026151. ^ a b c Furlan AD, van Tulder MW, Cherkin DC, Tsukayama H, Lao L, Koes BW, Berman BM (January 2005). Furlan AD (ed.). “Acupuncture and dry-needling for low back pain”. The Cochrane Database of Systematic Reviews (1): CD001351. doi:10.1002/14651858.CD001351.pub2. PMID 15674876. ^ Seo SY, Lee KB, Shin JS, Lee J, Kim MR, Ha IH, Ko Y, Lee YJ (2017). “Effectiveness of Acupuncture and Electroacupuncture for Chronic Neck Pain: A Systematic Review and Meta-Analysis”. The American Journal of Chinese Medicine. 45 (8): 1573–1595. doi:10.1142/S0192415X17500859. PMID 29121797. ^ a b Liu L, Skinner M, McDonough S, Mabire L, Baxter GD (2 March 2015). “Acupuncture for low back pain: an overview of systematic reviews”. Evidence-Based Complementary and Alternative Medicine. Hindawi Publishing Corporation. 2015: 328196. doi:10.1155/2015/328196. PMC 4364128. PMID 25821485. ^ Chou R, Deyo R, Friedly J, Skelly A, Hashimoto R, Weimer M, Fu R, Dana T, Kraegel P, Griffin J, Grusing S, Brodt ED (April 2017). “Nonpharmacologic Therapies for Low Back Pain: A Systematic Review for an American College of Physicians Clinical Practice Guideline”. Annals of Internal Medicine. 166 (7): 493–505. doi:10.7326/M16-2459. PMID 28192793. ^ Stochkendahl MJ, Kjaer P, Hartvigsen J, Kongsted A, Aaboe J, Andersen M, Andersen MØ, Fournier G, Højgaard B, Jensen MB, Jensen LD, Karbo T, Kirkeskov L, Melbye M, Morsel-Carlsen L, Nordsteen J, Palsson TS, Rasti Z, Silbye PF, Steiness MZ, Tarp S, Vaagholt M (January 2018). “National Clinical Guidelines for non-surgical treatment of patients with recent onset low back pain or lumbar radiculopathy”. European Spine Journal. 27 (1): 60–75. doi:10.1007/s00586-017-5099-2. PMID 28429142. ^ Linde K, Allais G, Brinkhaus B, Fei Y, Mehring M, Shin BC, Vickers A, White AR (April 2016). “Acupuncture for the prevention of tension-type headache”. The Cochrane Database of Systematic Reviews. 4: CD007587. doi:10.1002/14651858.CD007587.pub2. PMC 4955729. PMID 27092807. ^ a b Linde K, Allais G, Brinkhaus B, Fei Y, Mehring M, Vertosick EA, Vickers A, White AR (June 2016). “Acupuncture for the prevention of episodic migraine”. The Cochrane Database of Systematic Reviews (Systematic Review). 6 (6): CD001218. doi:10.1002/14651858.CD001218.pub3. PMC 4977344. PMID 27351677. ^ Lee C, Crawford C, Wallerstedt D, York A, Duncan A, et al. (October 2012). “The effectiveness of acupuncture research across components of the trauma spectrum response (tsr): a systematic review of reviews”. Systematic Reviews. 1 (1): 46. doi:10.1186/2046-4053-1-46. PMC 3534620. PMID 23067573. ^ Manyanga T, Froese M, Zarychanski R, Abou-Setta A, Friesen C, Tennenhouse M, Shay BL (August 2014). “Pain management with acupuncture in osteoarthritis: a systematic review and meta-analysis”. BMC Complementary and Alternative Medicine. 14 (1): 312. doi:10.1186/1472-6882-14-312. PMC 4158087. PMID 25151529. ^ Kmietowicz Z (September 2014). “Acupuncture does not improve chronic knee pain, study finds”. BMJ. 349 (sep30 27): g5899. doi:10.1136/bmj.g5899. PMID 25273362. ^ Corbett MS, Rice SJ, Madurasinghe V, Slack R, Fayter DA, Harden M, Sutton AJ, Macpherson H, Woolacott NF (September 2013). “Acupuncture and other physical treatments for the relief of pain due to osteoarthritis of the knee: network meta-analysis”. Osteoarthritis and Cartilage. 21 (9): 1290–8. doi:10.1016/j.joca.2013.05.007. PMC 3769860. PMID 23973143. ^ Manheimer E, Cheng K, Linde K, Lao L, Yoo J, Wieland S, van der Windt DA, Berman BM, Bouter LM (January 2010). Manheimer E (ed.). “Acupuncture for peripheral joint osteoarthritis”. The Cochrane Database of Systematic Reviews (1): CD001977. doi:10.1002/14651858.CD001977.pub2. PMC 3169099. PMID 20091527. ^ Deare JC, Zheng Z, Xue CC, Liu JP, Shang J, Scott SW, Littlejohn G (May 2013). “Acupuncture for treating fibromyalgia”. The Cochrane Database of Systematic Reviews. 5 (5): CD007070. doi:10.1002/14651858.CD007070.pub2. PMC 4105202. PMID 23728665. ^ Langhorst J, Klose P, Musial F, Irnich D, Häuser W (April 2010). “Efficacy of acupuncture in fibromyalgia syndrome–a systematic review with a meta-analysis of controlled clinical trials”. Rheumatology. 49 (4): 778–88. doi:10.1093/rheumatology/kep439. PMID 20100789. ^ Casimiro L, Barnsley L, Brosseau L, Milne S, et al. (October 2005). Casimiro L (ed.). 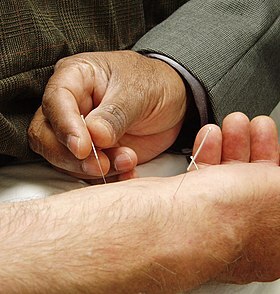 “Acupuncture and electroacupuncture for the treatment of rheumatoid arthritis”. The Cochrane Database of Systematic Reviews. 2005 (4): CD003788. doi:10.1002/14651858.CD003788.pub2. PMID 16235342. Archived from the original on 13 April 2008. ^ Ernst E, Lee MS (October 2010). “Acupuncture for rheumatic conditions: an overview of systematic reviews”. Rheumatology. 49 (10): 1957–61. doi:10.1093/rheumatology/keq180. PMID 20591833. ^ Seca S, Miranda D, Cardoso D, Nogueira B, Greten HJ, Cabrita A, Rodrigues MA (19 December 2018). “Effectiveness of Acupuncture on Pain, Physical Function and Health-Related Quality of Life in Patients with Rheumatoid Arthritis: A Systematic Review of Quantitative Evidence”. Chinese Journal of Integrative Medicine. doi:10.1007/s11655-018-2914-x. PMID 30569405. ^ Chang WD, Lai PT, Tsou YA (2014). “Analgesic effect of manual acupuncture and laser acupuncture for lateral epicondylalgia: a systematic review and meta-analysis”. The American Journal of Chinese Medicine. 42 (6): 1301–14. doi:10.1142/S0192415X14500815. PMID 25384448. ^ White A, Foster NE, Cummings M, Barlas P (March 2007). “Acupuncture treatment for chronic knee pain: a systematic review”. Rheumatology. 46 (3): 384–90. doi:10.1093/rheumatology/kel413. PMID 17215263. ^ a b c Lee MS, Ernst E (June 2014). “Acupuncture for surgical conditions: an overview of systematic reviews”. International Journal of Clinical Practice. 68 (6): 783–9. doi:10.1111/ijcp.12372. PMID 24447388. ^ Cheong KB, Zhang JP, Huang Y, Zhang ZJ (13 December 2013). “The effectiveness of acupuncture in prevention and treatment of postoperative nausea and vomiting–a systematic review and meta-analysis”. PLOS One. 8 (12): e82474. doi:10.1371/journal.pone.0082474. PMC 3862842. PMID 24349293. ^ Lee A, Chan SK, Fan LT (November 2015). “Stimulation of the wrist acupuncture point PC6 for preventing postoperative nausea and vomiting”. The Cochrane Database of Systematic Reviews (11): CD003281. doi:10.1002/14651858.CD003281.pub4. PMC 4679372. PMID 26522652. ^ Wetterslev J, Jakobsen JC, Gluud C (March 2017). “Trial Sequential Analysis in systematic reviews with meta-analysis”. BMC Medical Research Methodology. 17 (1): 39. doi:10.1186/s12874-017-0315-7. PMC 5397700. PMID 28264661. ^ Cho YH, Kim CK, Heo KH, Lee MS, Ha IH, Son DW, Choi BK, Song GS, Shin BC (March 2015). “Acupuncture for acute postoperative pain after back surgery: a systematic review and meta-analysis of randomized controlled trials”. Pain Practice. 15 (3): 279–91. doi:10.1111/papr.12208. PMC 4409074. PMID 24766648. ^ Cheong KB, Zhang JP, Huang Y (August 2014). “The effectiveness of acupuncture in postoperative gastroparesis syndrome–a systematic review and meta-analysis”. Complementary Therapies in Medicine. 22 (4): 767–86. doi:10.1016/j.ctim.2014.05.002. PMID 25146082. ^ Paley CA, Johnson MI, Tashani OA, Bagnall AM (October 2015). “Acupuncture for cancer pain in adults”. The Cochrane Database of Systematic Reviews. 10 (10): CD007753. doi:10.1002/14651858.CD007753.pub3. PMID 26468973. ^ Lian WL, Pan MQ, Zhou DH, Zhang ZJ (February 2014). “Effectiveness of acupuncture for palliative care in cancer patients: a systematic review”. Chinese Journal of Integrative Medicine. 20 (2): 136–47. doi:10.1007/s11655-013-1439-1. PMID 24338183. ^ Towler P, Molassiotis A, Brearley SG (October 2013). “What is the evidence for the use of acupuncture as an intervention for symptom management in cancer supportive and palliative care: an integrative overview of reviews”. Supportive Care in Cancer. 21 (10): 2913–23. doi:10.1007/s00520-013-1882-8. PMID 23868190. ^ Choi TY, Lee MS, Kim TH, Zaslawski C, Ernst E (June 2012). “Acupuncture for the treatment of cancer pain: a systematic review of randomised clinical trials”. Supportive Care in Cancer. 20 (6): 1147–58. doi:10.1007/s00520-012-1432-9. PMID 22447366. ^ Ling WM, Lui LY, So WK, Chan K (November 2014). “Effects of acupuncture and acupressure on cancer-related fatigue: a systematic review”. Oncology Nursing Forum. 41 (6): 581–92. doi:10.1188/14.ONF.581-592. PMID 25355016. ^ Garcia MK, McQuade J, Haddad R, Patel S, Lee R, Yang P, Palmer JL, Cohen L (March 2013). “Systematic review of acupuncture in cancer care: a synthesis of the evidence”. Journal of Clinical Oncology. 31 (7): 952–60. doi:10.1200/JCO.2012.43.5818. PMC 3577953. PMID 23341529. ^ Posadzki P, Moon TW, Choi TY, Park TY, Lee MS, Ernst E (July 2013). “Acupuncture for cancer-related fatigue: a systematic review of randomized clinical trials”. Supportive Care in Cancer. 21 (7): 2067–73. doi:10.1007/s00520-013-1765-z. PMID 23435597. ^ Chiu HY, Hsieh YJ, Tsai PS (March 2016). “Acupuncture to Reduce Sleep Disturbances in Perimenopausal and Postmenopausal Women: A Systematic Review and Meta-analysis”. Obstetrics and Gynecology. 127 (3): 507–15. doi:10.1097/AOG.0000000000001268. PMID 26855097. ^ Cho SH, Whang WW (August 2009). “Acupuncture for alcohol dependence: a systematic review”. Alcoholism, Clinical and Experimental Research. 33 (8): 1305–13. doi:10.1111/j.1530-0277.2009.00959.x. PMID 19413653. ^ a b Feng S, Han M, Fan Y, Yang G, Liao Z, Liao W, Li H (2015). “Acupuncture for the treatment of allergic rhinitis: a systematic review and meta-analysis”. American Journal of Rhinology & Allergy. 29 (1): 57–62. doi:10.2500/ajra.2015.29.4116. PMID 25590322. ^ Pfab F, Schalock PC, Napadow V, Athanasiadis GI, Huss-Marp J, Ring J (July 2014). “Acupuncture for allergic disease therapy–the current state of evidence”. Expert Review of Clinical Immunology. 10 (7): 831–41. doi:10.1586/1744666X.2014.924855. PMID 24881629. ^ Shah R, Greenberger PA (2012). “Chapter 29: Unproved and controversial methods and theories in allergy-immunology”. Allergy and Asthma Proceedings. 33 Suppl 1 (3): 100–102. doi:10.2500/aap.2012.33.3562. PMID 22794702. ^ Lee MS, Shin BC, Ernst E (June 2009). “Acupuncture for Alzheimer’s disease: a systematic review”. International Journal of Clinical Practice. 63 (6): 874–9. doi:10.1111/j.1742-1241.2009.02043.x. PMID 19490197. ^ Yu C, Ji K, Cao H, Wang Y, Jin HH, Zhang Z, Yang G (March 2015). “Effectiveness of acupuncture for angina pectoris: a systematic review of randomized controlled trials”. BMC Complementary and Alternative Medicine. 15 (1): 90. doi:10.1186/s12906-015-0586-7. PMC 4426772. PMID 25888363. ^ Kim TH, Lee MS, Kim KH, Kang JW, et al. (June 2014). “Acupuncture for treating acute ankle sprains in adults”. Bone, Joint and Muscle Trauma Group. The Cochrane Database of Systematic Reviews. John Wiley & Sons. 6 (6): CD009065. doi:10.1002/14651858.CD009065.pub2. PMID 24953665. ^ Park J, Hahn S, Park JY, Park HJ, Lee H (March 2013). “Acupuncture for ankle sprain: systematic review and meta-analysis”. BMC Complementary and Alternative Medicine. 13 (1): 55. doi:10.1186/1472-6882-13-55. PMC 3606608. PMID 23496981. ^ McCarney RW, Brinkhaus B, Lasserson TJ, Linde K (2003). McCarney RW (ed.). “Acupuncture for chronic asthma”. The Cochrane Database of Systematic Reviews. 2003 (1): CD000008. doi:10.1002/14651858.CD000008.pub2. PMID 14973944. Archived from the original on 19 April 2008. ^ Zhang J, Li X, Xu J, Ernst E (September 2012). “Laser acupuncture for the treatment of asthma in children: a systematic review of randomized controlled trials”. The Journal of Asthma. 49 (7): 773–7. doi:10.3109/02770903.2012.691194. PMID 22873427. ^ Li S, Yu B, Zhou D, He C, Kang L, Wang X, Jiang S, Chen X (April 2011). “Acupuncture for Attention Deficit Hyperactivity Disorder (ADHD) in children and adolescents”. The Cochrane Database of Systematic Reviews (Systematic review) (4): CD007839. doi:10.1002/14651858.CD007839.pub2. PMID 21491402. ^ Lee MS, Choi TY, Kim JI, Kim L, Ernst E (April 2011). “Acupuncture for treating attention deficit hyperactivity disorder: a systematic review and meta-analysis”. Chinese Journal of Integrative Medicine (Systematic review). 17 (4): 257–60. doi:10.1007/s11655-011-0701-7. PMID 21509667. ^ Cheuk DK, Wong V, Chen WX (September 2011). Cheuk DK (ed.). “Acupuncture for autism spectrum disorders (ASD)”. The Cochrane Database of Systematic Reviews. 9 (9): CD007849. doi:10.1002/14651858.CD007849.pub2. PMID 21901712. ^ Lee MS, Choi TY, Shin BC, Ernst E (August 2012). “Acupuncture for children with autism spectrum disorders: a systematic review of randomized clinical trials”. Journal of Autism and Developmental Disorders. 42 (8): 1671–83. doi:10.1007/s10803-011-1409-4. PMID 22124580. ^ Skjeie H, Skonnord T, Brekke M, Klovning A, Fetveit A, Landgren K, Hallström IK, Brurberg KG (March 2018). “Acupuncture treatments for infantile colic: a systematic review and individual patient data meta-analysis of blinding test validated randomised controlled trials”. Scandinavian Journal of Primary Health Care. 36 (1): 56–69. doi:10.1080/02813432.2018.1426146. PMC 5901442. PMID 29338487. ^ Chen N, Zhou M, He L, Zhou D, Li N (August 2010). “Acupuncture for Bell’s palsy”. The Cochrane Database of Systematic Reviews (8): CD002914. doi:10.1002/14651858.CD002914.pub5. PMID 20687071. ^ Li P, Qiu T, Qin C (2015). “Efficacy of Acupuncture for Bell’s Palsy: A Systematic Review and Meta-Analysis of Randomized Controlled Trials”. PLOS One. 10 (5): e0121880. doi:10.1371/journal.pone.0121880. PMC 4431843. PMID 25974022. ^ Kim TH, Choi TY, Lee MS, Ernst E (June 2011). “Acupuncture treatment for cardiac arrhythmias: a systematic review of randomized controlled trials”. International Journal of Cardiology. 149 (2): 263–5. doi:10.1016/j.ijcard.2011.02.049. PMID 21421272. ^ Sim H, Shin BC, Lee MS, Jung A, Lee H, Ernst E (March 2011). “Acupuncture for carpal tunnel syndrome: a systematic review of randomized controlled trials”. The Journal of Pain. 12 (3): 307–14. doi:10.1016/j.jpain.2010.08.006. PMID 21093382. ^ Zheng GQ, Zhao ZM, Wang Y, Gu Y, Li Y, Chen XM, Fu SP, Shen J (April 2011). “Meta-analysis of scalp acupuncture for acute hypertensive intracerebral hemorrhage”. Journal of Alternative and Complementary Medicine. 17 (4): 293–9. doi:10.1089/acm.2010.0156. hdl:10722/138129. PMID 21438797. ^ Choi TY, Jun JH, Choi JY, Kim JI, Lee MS, Ernst E (April 2014). “Acupuncture for the treatment of chronic obstructive pulmonary disease: a protocol of a systematic review”. BMJ Open. 4 (4): e004590. doi:10.1136/bmjopen-2013-004590. PMC 4010841. PMID 24776710. ^ Gates S, Smith LA, Foxcroft DR (January 2006). Gates S (ed.). “Auricular acupuncture for cocaine dependence”. The Cochrane Database of Systematic Reviews. 2006 (1): CD005192. doi:10.1002/14651858.CD005192.pub2. PMID 16437523. ^ Zhang T, Chon TY, Liu B, Do A, Li G, Bauer B, Wang L, Liu Z (2013). “Efficacy of acupuncture for chronic constipation: a systematic review”. The American Journal of Chinese Medicine. 41 (4): 717–42. doi:10.1142/S0192415X13500493. PMID 23895148. ^ Smith CA, Armour M, Lee MS, Wang LQ, Hay PJ (March 2018). “Acupuncture for depression”. The Cochrane Database of Systematic Reviews. 3: CD004046. doi:10.1002/14651858.CD004046.pub4. PMID 29502347. ^ Ernst E, Lee MS, Choi TY (December 2011). “Acupuncture for depression? : A systematic review of systematic reviews”. Evaluation & the Health Professions. 34 (4): 403–12. doi:10.1177/0163278710386109. PMID 21138913. ^ Dimitrova A, Murchison C, Oken B (March 2017). “Acupuncture for the Treatment of Peripheral Neuropathy: A Systematic Review and Meta-Analysis”. Journal of Alternative and Complementary Medicine. 23 (3): 164–179. doi:10.1089/acm.2016.0155. PMC 5359694. PMID 28112552. ^ Xie Y, Wang L, He J, Wu T (July 2008). “Acupuncture for dysphagia in acute stroke”. The Cochrane Database of Systematic Reviews (3): CD006076. doi:10.1002/14651858.CD006076.pub2. PMID 18646136. ^ Jordan JB (June 2006). “Acupuncture treatment for opiate addiction: a systematic review”. Journal of Substance Abuse Treatment. 30 (4): 309–14. doi:10.1016/j.jsat.2006.02.005. PMID 16716845. ^ Gates S, Smith LA, Foxcroft DR (January 2006). Gates S (ed.). “Auricular acupuncture for cocaine dependence”. The Cochrane Database of Systematic Reviews (1): CD005192. doi:10.1002/14651858.CD005192.pub2. PMID 16437523. ^ Lee MS, Shin BC, Choi TY, Ernst E (March 2011). “Acupuncture for treating dry eye: a systematic review”. Acta Ophthalmologica. 89 (2): 101–6. doi:10.1111/j.1755-3768.2009.01855.x. PMID 20337604. ^ Smith CA, Armour M, Zhu X, Li X, Lu ZY, Song J (April 2016). “Acupuncture for dysmenorrhoea”. The Cochrane Database of Systematic Reviews (Systematic Review). 4: CD007854. doi:10.1002/14651858.CD007854.pub3. PMID 27087494. ^ Lan L, Zeng F, Liu GJ, Ying L, Wu X, Liu M, Liang FR (October 2014). “Acupuncture for functional dyspepsia”. The Cochrane Database of Systematic Reviews. 10 (10): CD008487. doi:10.1002/14651858.CD008487.pub2. PMID 25306866. ^ Zhu X, Hamilton KD, McNicol ED (September 2011). “Acupuncture for pain in endometriosis”. The Cochrane Database of Systematic Reviews (9): CD007864. doi:10.1002/14651858.CD007864.pub2. PMID 21901713. ^ Huang T, Shu X, Huang YS, Cheuk DK (December 2011). Huang T (ed.). “Complementary and miscellaneous interventions for nocturnal enuresis in children”. The Cochrane Database of Systematic Reviews. 12 (12): CD005230. doi:10.1002/14651858.CD005230.pub2. PMID 22161390. ^ Cheuk DK, Wong V (May 2014). “Acupuncture for epilepsy”. The Cochrane Database of Systematic Reviews. 5 (5): CD005062. doi:10.1002/14651858.CD005062.pub4. PMID 24801225. ^ Ernst E, Posadzki P, Lee MS (September 2011). “Complementary and alternative medicine (CAM) for sexual dysfunction and erectile dysfunction in older men and women: an overview of systematic reviews”. Maturitas. 70 (1): 37–41. doi:10.1016/j.maturitas.2011.06.011. PMID 21782365. ^ Kim KH, Lee MS, Choi TY, Kim TH (18 December 2018). “Acupuncture for symptomatic gastroparesis”. The Cochrane Database of Systematic Reviews. 12: CD009676. doi:10.1002/14651858.CD009676.pub2. PMID 30560568. ^ Law SK, Li T (May 2013). “Acupuncture for glaucoma”. The Cochrane Database of Systematic Reviews. 5 (5): CD006030. doi:10.1002/14651858.CD006030.pub3. PMC 3804313. PMID 23728656. ^ Kang HS, Jeong D, Kim DI, Lee MS (April 2011). “The use of acupuncture for managing gynaecologic conditions: An overview of systematic reviews”. Maturitas. 68 (4): 346–54. doi:10.1016/j.maturitas.2011.02.001. PMID 21376483. ^ Cheng K, Law A, Guo M, Wieland LS, Shen X, Lao L (February 2017). “Acupuncture for acute hordeolum”. The Cochrane Database of Systematic Reviews. 2: CD011075. doi:10.1002/14651858.CD011075.pub2. PMC 5378315. PMID 28181687. ^ Dodin S, Blanchet C, Marc I, Ernst E, Wu T, Vaillancourt C, Paquette J, Maunsell E (July 2013). “Acupuncture for menopausal hot flushes”. The Cochrane Database of Systematic Reviews. 7 (7): CD007410. doi:10.1002/14651858.CD007410.pub2. PMID 23897589. ^ Salehi A, Marzban M, Zadeh AR (December 2016). “Acupuncture for treating hot flashes in breast cancer patients: an updated meta-analysis”. Supportive Care in Cancer. 24 (12): 4895–4899. doi:10.1007/s00520-016-3345-5. PMID 27497608. ^ Chiu HY, Shyu YK, Chang PC, Tsai PS (2016). “Effects of Acupuncture on Menopause-Related Symptoms in Breast Cancer Survivors: A Meta-analysis of Randomized Controlled Trials”. Cancer Nursing. 39 (3): 228–37. doi:10.1097/NCC.0000000000000278. PMID 26050143. ^ Wang J, Xiong X, Liu W (November 2013). “Acupuncture for essential hypertension”. International Journal of Cardiology. 169 (5): 317–26. doi:10.1016/j.ijcard.2013.09.001. PMID 24060112. ^ Wong, Virginia; Cheuk, Daniel KL; Chu, Vanessa (31 January 2013). “Acupuncture for hypoxic ischemic encephalopathy in neonates”. Cochrane Database of Systematic Reviews (1): CD007968. doi:10.1002/14651858.cd007968.pub2. ISSN 1465-1858. PMID 23440822. ^ Cheong YC, Dix S, Hung Yu Ng E, Ledger WL, Farquhar C (July 2013). “Acupuncture and assisted reproductive technology”. The Cochrane Database of Systematic Reviews. 7 (7): CD006920. doi:10.1002/14651858.CD006920.pub3. PMID 23888428. ^ Smith CA, Armour M, Shewamene Z, Tan HY, Norman RJ, Johnson NP (2 January 2019). “Acupuncture performed around the time of embryo transfer: a systematic review and meta-analysis”. Reproductive Biomedicine Online. 38 (3): 364–379. doi:10.1016/j.rbmo.2018.12.038. PMID 30658892. ^ Smith CA, Armour M, Dahlen HG (October 2017). “Acupuncture or acupressure for induction of labour”. The Cochrane Database of Systematic Reviews. 10: CD002962. doi:10.1002/14651858.CD002962.pub4. PMID 29036756. ^ Santesso N (July 2014). “A summary of a cochrane review: acupuncture for induction of labor”. Global Advances in Health and Medicine. 3 (4): 64–5. doi:10.7453/gahmj.2014.027. PMC 4104567. PMID 25105081. ^ Cheuk DK, Yeung WF, Chung KF, Wong V (September 2012). Cheuk DK (ed.). “Acupuncture for insomnia”. The Cochrane Database of Systematic Reviews. 9 (9): CD005472. doi:10.1002/14651858.CD005472.pub3. hdl:10722/198790. PMID 22972087. ^ Ernst E, Lee MS, Choi TY (June 2011). “Acupuncture for insomnia? An overview of systematic reviews”. The European Journal of General Practice. 17 (2): 116–23. doi:10.3109/13814788.2011.568475. PMID 21463162. ^ Shergis JL, Ni X, Jackson ML, Zhang AL, Guo X, Li Y, Lu C, Xue CC (June 2016). “A systematic review of acupuncture for sleep quality in people with insomnia”. Complementary Therapies in Medicine. 26: 11–20. doi:10.1016/j.ctim.2016.02.007. PMID 27261976. ^ Manheimer E, Cheng K, Wieland LS, Min LS, Shen X, Berman BM, Lao L (May 2012). “Acupuncture for treatment of irritable bowel syndrome”. The Cochrane Database of Systematic Reviews. 5 (5): CD005111. doi:10.1002/14651858.CD005111.pub3. PMC 3718572. PMID 22592702. ^ Smith CA, Collins CT, Crowther CA, Levett KM (July 2011). “Acupuncture or acupressure for pain management in labour”. The Cochrane Database of Systematic Reviews (7): CD009232. doi:10.1002/14651858.CD009232. PMID 21735441. ^ Cho SH, Lee H, Ernst E (July 2010). “Acupuncture for pain relief in labour: a systematic review and meta-analysis”. BJOG. 117 (8): 907–20. doi:10.1111/j.1471-0528.2010.02570.x. PMID 20438555. ^ Kim KH, Kim TH, Lee BR, Kim JK, Son DW, Lee SW, Yang GY (October 2013). “Acupuncture for lumbar spinal stenosis: a systematic review and meta-analysis”. Complementary Therapies in Medicine. 21 (5): 535–56. doi:10.1016/j.ctim.2013.08.007. PMID 24050593. ^ Dennis CL, Dowswell T (July 2013). “Interventions (other than pharmacological, psychosocial or psychological) for treating antenatal depression”. The Cochrane Database of Systematic Reviews. 7 (7): CD006795. doi:10.1002/14651858.CD006795.pub3. PMID 23904069. ^ He J, Jia P, Zheng M, Zhang M, Jiang H (February 2015). “Acupuncture for mumps in children”. The Cochrane Database of Systematic Reviews (2): CD008400. doi:10.1002/14651858.CD008400.pub3. PMID 25922859. ^ Cox J, Varatharajan S, Côté P, Optima Collaboration (June 2016). “Effectiveness of Acupuncture Therapies to Manage Musculoskeletal Disorders of the Extremities: A Systematic Review”. The Journal of Orthopaedic and Sports Physical Therapy. 46 (6): 409–29. doi:10.2519/jospt.2016.6270. PMID 27117725. ^ Wei ML, Liu JP, Li N, Liu M (September 2011). Wei ML (ed.). “Acupuncture for slowing the progression of myopia in children and adolescents”. The Cochrane Database of Systematic Reviews. 9 (9): CD007842. doi:10.1002/14651858.CD007842.pub2. PMID 21901710. ^ Ju ZY, Wang K, Cui HS, Yao Y, Liu SM, Zhou J, Chen TY, Xia J (December 2017). “Acupuncture for neuropathic pain in adults”. The Cochrane Database of Systematic Reviews. 12: CD012057. doi:10.1002/14651858.CD012057.pub2. PMID 29197180. ^ Sui Y, Zhao HL, Wong VC, Brown N, Li XL, Kwan AK, Hui HL, Ziea ET, Chan JC (May 2012). “A systematic review on use of Chinese medicine and acupuncture for treatment of obesity”. Obesity Reviews. 13 (5): 409–30. doi:10.1111/j.1467-789X.2011.00979.x. PMID 22292480. ^ Esteghamati A, Mazaheri T, Vahidi Rad M, Noshad S (April 2015). “Complementary and alternative medicine for the treatment of obesity: a critical review”. International Journal of Endocrinology and Metabolism. 13 (2): e19678. doi:10.5812/ijem.19678. PMC 4386228. PMID 25892995. ^ Ernst E, Lee MS, Choi TY (2011). “Acupuncture in obstetrics and gynecology: an overview of systematic reviews”. The American Journal of Chinese Medicine. 39 (3): 423–31. doi:10.1142/S0192415X11008920. PMID 21598411. ^ Boyuan Z, Yang C, Ke C, Xueyong S, Sheng L (2014). “Efficacy of acupuncture for psychological symptoms associated with opioid addiction: a systematic review and meta-analysis”. Evidence-Based Complementary and Alternative Medicine. 2014: 313549. doi:10.1155/2014/313549. PMC 4235186. PMID 25530779. ^ Baker TE, Chang G (December 2016). “The use of auricular acupuncture in opioid use disorder: A systematic literature review”. The American Journal on Addictions. 25 (8): 592–602. doi:10.1111/ajad.12453. PMID 28051842. ^ Noh H, Kwon S, Cho SY, Jung WS, Moon SK, Park JM, Ko CN, Park SU (October 2017). “Effectiveness and safety of acupuncture in the treatment of Parkinson’s disease: A systematic review and meta-analysis of randomized controlled trials”. Complementary Therapies in Medicine. 34: 86–103. doi:10.1016/j.ctim.2017.08.005. PMID 28917379. ^ Lim CE, Ng RW, Xu K, Cheng NC, et al. (May 2016). Lim DC (ed.). “Acupuncture for polycystic ovarian syndrome”. The Cochrane Database of Systematic Reviews (5): CD007689. doi:10.1002/14651858.CD007689.pub3. PMID 27136291. ^ Jo J, Lee YJ, Lee H (June 2017). “Acupuncture for polycystic ovarian syndrome: A systematic review and meta-analysis”. Medicine. 96 (23): e7066. doi:10.1097/MD.0000000000007066. PMC 5466220. PMID 28591042. ^ Grant S, Colaiaco B, Motala A, Shanman R, Sorbero M, Hempel S (2 February 2017). “Acupuncture for the Treatment of Adults with Posttraumatic Stress Disorder: A Systematic Review and Meta-Analysis”. Journal of Trauma & Dissociation. 19 (1): 39–58. doi:10.1080/15299732.2017.1289493. PMID 28151093. ^ Kim SY, Park HJ, Lee H, Lee H (July 2011). “Acupuncture for premenstrual syndrome: a systematic review and meta-analysis of randomised controlled trials”. BJOG. 118 (8): 899–915. doi:10.1111/j.1471-0528.2011.02994.x. PMID 21609380. ^ Bae H, Bae H, Min BI, Cho S (2014). “Efficacy of acupuncture in reducing preoperative anxiety: a meta-analysis”. Evidence-Based Complementary and Alternative Medicine. 2014: 850367. doi:10.1155/2014/850367. PMC 4165564. PMID 25254059. ^ Cui Y, Wang Y, Liu Z (October 2008). “Acupuncture for restless legs syndrome”. The Cochrane Database of Systematic Reviews (4): CD006457. doi:10.1002/14651858.CD006457.pub2. PMID 18843716. ^ Shen X, Xia J, Adams CE (October 2014). “Acupuncture for schizophrenia”. The Cochrane Database of Systematic Reviews. 10 (10): CD005475. doi:10.1002/14651858.CD005475.pub2. PMC 4193731. PMID 25330045. ^ Zhang XC, Xu XP, Xu WT, Hou WZ, Cheng YY, Li CX, Ni GX (2015). “Acupuncture therapy for sudden sensorineural hearing loss: a systematic review and meta-analysis of randomized controlled trials”. PLOS One. 10 (4): e0125240. doi:10.1371/journal.pone.0125240. PMC 4412536. PMID 25919000. ^ Green S, Buchbinder R, Hetrick S (April 2005). “Acupuncture for shoulder pain”. The Cochrane Database of Systematic Reviews (2): CD005319. doi:10.1002/14651858.CD005319. PMID 15846753. ^ White AR, Rampes H, Liu JP, Stead LF, Campbell J (January 2014). “Acupuncture and related interventions for smoking cessation”. The Cochrane Database of Systematic Reviews (Systematic review). 1 (1): CD000009. doi:10.1002/14651858.CD000009.pub4. PMID 24459016. ^ Wang Y, Zhishun L, Peng W, Zhao J, Liu B (July 2013). “Acupuncture for stress urinary incontinence in adults”. The Cochrane Database of Systematic Reviews. 7 (7): CD009408. doi:10.1002/14651858.CD009408.pub2. PMID 23818069. ^ Zhang JH, Wang D, Liu M (2014). “Overview of systematic reviews and meta-analyses of acupuncture for stroke”. Neuroepidemiology (Systematic review). 42 (1): 50–8. CiteSeerX 10.1.1.673.9776. doi:10.1159/000355435. PMID 24356063. ^ Zhang SH, Liu M, Asplund K, Li L (April 2005). Liu M (ed.). “Acupuncture for acute stroke”. The Cochrane Database of Systematic Reviews. 2005 (2): CD003317. doi:10.1002/14651858.CD003317.pub2. PMID 15846657. Archived from the original on 29 April 2008. ^ Yang A, Wu HM, Tang JL, Xu L, et al. (August 2016). Wu HM (ed.). “Acupuncture for stroke rehabilitation”. The Cochrane Database of Systematic Reviews (8): CD004131. doi:10.1002/14651858.CD004131.pub3. PMID 27562656. ^ Laurence B (March 2012). “Acupuncture may be no more effective than sham acupuncture in treating temporomandibular joint disorders”. The Journal of Evidence-Based Dental Practice. 12 (1): 2–4. doi:10.1016/j.jebdp.2011.12.001. PMID 22326146. ^ La Touche R, Goddard G, De-la-Hoz JL, Wang K, Paris-Alemany A, Angulo-Díaz-Parreño S, Mesa J, Hernández M (2010). “Acupuncture in the treatment of pain in temporomandibular disorders: a systematic review and meta-analysis of randomized controlled trials”. The Clinical Journal of Pain. 26 (6): 541–50. doi:10.1097/AJP.0b013e3181e2697e. PMID 20551730. ^ Green S, Buchbinder R, Barnsley L, Hall S, et al. (2002). Green S (ed.). “Acupuncture for lateral elbow pain”. The Cochrane Database of Systematic Reviews. 2002 (1): CD003527. doi:10.1002/14651858.CD003527. PMID 11869671. ^ Kim JI, Choi JY, Lee DH, Choi TY, et al. (July 2012). “Acupuncture for the treatment of tinnitus: a systematic review of randomized clinical trials”. BMC Complementary and Alternative Medicine. 12 (1): 97. doi:10.1186/1472-6882-12-97. PMC 3493359. PMID 22805113. ^ Liu F, Han X, Li Y, Yu S (February 2016). “Acupuncture in the treatment of tinnitus: a systematic review and meta-analysis”. European Archives of Oto-Rhino-Laryngology. 273 (2): 285–94. doi:10.1007/s00405-014-3341-7. PMID 25344063. ^ Wong V, Cheuk DK, Lee S, Chu V (March 2013). “Acupuncture for acute management and rehabilitation of traumatic brain injury”. The Cochrane Database of Systematic Reviews. 3 (3): CD007700. doi:10.1002/14651858.CD007700.pub3. hdl:10722/129323. PMID 23543554. ^ Kim KH, Lee MS, Choi SM (July 2010). “Acupuncture for treating uremic pruritus in patients with end-stage renal disease: a systematic review”. Journal of Pain and Symptom Management. 40 (1): 117–25. doi:10.1016/j.jpainsymman.2009.11.325. PMID 21796811. ^ Zhang Y, Peng W, Clarke J, Liu Z (January 2010). “Acupuncture for uterine fibroids”. The Cochrane Database of Systematic Reviews (1): CD007221. doi:10.1002/14651858.CD007221.pub2. PMID 20091625. ^ Peng WN, Zhao H, Liu ZS, Wang S (April 2007). Weina P (ed.). “Acupuncture for vascular dementia”. The Cochrane Database of Systematic Reviews. 2007 (2): CD004987. doi:10.1002/14651858.CD004987.pub2. PMID 17443563. ^ Moon TW, Posadzki P, Choi TY, Park TY, Kim HJ, Lee MS, Ernst E (2014). “Acupuncture for treating whiplash associated disorder: a systematic review of randomised clinical trials”. Evidence-Based Complementary and Alternative Medicine. 2014: 870271. doi:10.1155/2014/870271. PMC 4034516. PMID 24899912. ^ Assy Z, Brand HS (February 2018). “A systematic review of the effects of acupuncture on xerostomia and hyposalivation”. BMC Complementary and Alternative Medicine. 18 (1): 57. doi:10.1186/s12906-018-2124-x. PMC 5811978. PMID 29439690. ^ Lee MS, Kang JW, Ernst E (November 2010). “Does moxibustion work? An overview of systematic reviews”. BMC Research Notes. 3 (1): 284. doi:10.1186/1756-0500-3-284. PMC 2987875. PMID 21054851. ^ a b c Bergqvist D (February 2013). “Vascular injuries caused by acupuncture. A systematic review”. International Angiology. 32 (1): 1–8. PMID 23435388. ^ a b Ernst E, Zhang J (June 2011). “Cardiac tamponade caused by acupuncture: a review of the literature”. International Journal of Cardiology. 149 (3): 287–9. doi:10.1016/j.ijcard.2010.10.016. PMID 21093944. ^ a b Mcculloch M, Nachat A, Schwartz J, Casella-Gordon V, Cook J (2014). “Acupuncture safety in patients receiving anticoagulants: a systematic review”. The Permanente Journal. 19 (1): 68–73. doi:10.7812/TPP/14-057. PMC 4315381. PMID 25432001. ^ a b c d e f g h i j k l Zhang J, Shang H, Gao X, Ernst E (December 2010). “Acupuncture-related adverse events: a systematic review of the Chinese literature”. Bulletin of the World Health Organization. 88 (12): 915–921C. doi:10.2471/BLT.10.076737. PMC 2995190. PMID 21124716. ^ Shin HK, Jeong SJ, Lee MS, Ernst E (August 2013). “Adverse events attributed to traditional Korean medical practices: 1999-2010”. Bulletin of the World Health Organization. 91 (8): 569–75. doi:10.2471/BLT.12.111609. PMC 3738306. PMID 23940404. ^ Yamashita H, Tsukayama H (December 2008). “Safety of acupuncture practice in Japan: patient reactions, therapist negligence and error reduction strategies”. Evidence-Based Complementary and Alternative Medicine. 5 (4): 391–8. doi:10.1093/ecam/nem086. PMC 2586322. PMID 18955234. ^ Barnes, Patricia M. (10 December 2008). “Complementary and Alternative Medicine Use Among Adults and Children: United States, 2007” (PDF). National Center for Complimentary and Integrative Health. NCHS. Retrieved 5 February 2016. ^ Jindal V, Ge A, Mansky PJ (June 2008). “Safety and efficacy of acupuncture in children: a review of the evidence”. Journal of Pediatric Hematology/Oncology. 30 (6): 431–42. doi:10.1097/MPH.0b013e318165b2cc. PMC 2518962. PMID 18525459. Park J, Sohn Y, White AR, Lee H (June 2014). “The safety of acupuncture during pregnancy: a systematic review”. Acupuncture in Medicine (Systematic review). 32 (3): 257–66. doi:10.1136/acupmed-2013-010480. PMC 4112450. PMID 24554789. ^ Ambrósio EM, Bloor K, MacPherson H (October 2012). “Costs and consequences of acupuncture as a treatment for chronic pain: a systematic review of economic evaluations conducted alongside randomised controlled trials”. Complementary Therapies in Medicine. 20 (5): 364–74. doi:10.1016/j.ctim.2012.05.002. PMID 22863652. ^ “Final Report, Report into Traditional Chinese Medicine” (PDF). Parliament of New South Wales. 9 November 2005. Archived from the original (PDF) on 29 January 2011. Retrieved 3 November 2010. ^ “NCCAOM Code of Ethics” (PDF). National Certification Commission for Acupuncture and Oriental Medicine. Archived from the original (PDF) on 27 November 2010. Retrieved 3 November 2010. ^ Barrett S (2013). “‘Alternative’ Medicine: More Hype Than Hope”. In Humber JM, Almeder RF (eds.). Alternative Medicine and Ethics. Springer Science & Business Media. p. 10. ISBN 978-1-4757-2774-6. ^ Aung & Chen Aung SK, Chen WP (2007). Clinical Introduction to Medical Acupuncture. Thieme. pp. 11–12. ISBN 978-1-58890-221-4. ^ “（三）十二经脉 …（四）奇经八脉 …” [(3.) The Twelve Vessels … (4.) The Extraordinary Eight Vessels …] as seen at 经络学 [Meridian theory] (in Chinese). Archived from the original on 10 November 2016. Retrieved 22 February 2011. ^ a b Aung & Chen, 2007, p. 101. ^ Ergil MC, Ergil KV (2009). Pocket Atlas of Chinese Medicine. Stuttgart: Thieme. p. 19, 148. ISBN 9783131416117. ^ Flaws B, Finney D (2007). A handbook of TCM patterns & their treatments (6th ed.). Blue Poppy Press. pp. 1. ISBN 9780936185705. ^ Flaws B, Finney D (1996). A handbook of TCM patterns & their treatments (6 (2007) ed.). Blue Poppy Press. pp. 169–173. ISBN 9780936185705. ^ Maciocia, G (1995). Tongue Diagnosis in Chinese Medicine. Eastland Press. ISBN 978-0939616190. ^ Maciocia, G (2005). The Foundations of Chinese Medicine. Churchill Livingstone. ISBN 978-0443074899. ^ Ross, J (1984). Zang Fu, the organ systems of traditional Chinese medicine. Elsevier. pp. 26. ISBN 9780443034824. ^ “Hard to swallow”. Nature. 448 (7150): 105–6. July 2007. doi:10.1038/448106a. PMID 17625521. ^ a b c Ulett, GA (2002). “Acupuncture”. In Shermer, M (ed.). The Skeptic: Encyclopedia of Pseudoscience. ABC-CLIO. p. 283291. ISBN 978-1576076538. ^ Wang SM, Harris RE, Lin YC, Gan TJ (June 2013). “Acupuncture in 21st century anesthesia: is there a needle in the haystack?” (PDF). Anesthesia and Analgesia. 116 (6): 1356–9. doi:10.1213/ANE.0b013e31828f5efa. PMID 23709075. ^ Pigliucci M (2013). Philosophy of Pseudoscience: Reconsidering the Demarcation Problem. University of Chicago Press. p. 206. ISBN 9780226051826. ^ a b Wang SM, Kain ZN, White P (February 2008). “Acupuncture analgesia: I. The scientific basis”. Anesthesia and Analgesia. 106 (2): 602–10. doi:10.1213/01.ane.0000277493.42335.7b. PMID 18227322. ^ Staud R, Price DD (May 2006). “Mechanisms of acupuncture analgesia for clinical and experimental pain”. Expert Review of Neurotherapeutics. 6 (5): 661–7. doi:10.1586/14737175.6.5.661. PMID 16734514. ^ Langevin HM (2014). “Acupuncture, connective tissue, and peripheral sensory modulation”. Critical Reviews in Eukaryotic Gene Expression. 24 (3): 249–53. doi:10.1615/CritRevEukaryotGeneExpr.2014008284. PMID 25072149. ^ Takahashi T (January 2011). “Mechanism of acupuncture on neuromodulation in the gut–a review”. Neuromodulation. 14 (1): 8–12, discussion 12. doi:10.1111/j.1525-1403.2010.00295.x. PMID 21992155. ^ Li H, He T, Xu Q, Li Z, Liu Y, Li F, Yang BF, Liu CZ (July 2015). “Acupuncture and regulation of gastrointestinal function”. World Journal of Gastroenterology. 21 (27): 8304–13. doi:10.3748/wjg.v21.i27.8304. PMC 4507100. PMID 26217082. ^ Kavoussi B, Ross BE (September 2007). “The neuroimmune basis of anti-inflammatory acupuncture”. Integrative Cancer Therapies. 6 (3): 251–7. doi:10.1177/1534735407305892. PMID 17761638. ^ Huang W, Pach D, Napadow V, Park K, Long X, Neumann J, Maeda Y, Nierhaus T, Liang F, Witt CM (9 April 2012). “Characterizing acupuncture stimuli using brain imaging with FMRI–a systematic review and meta-analysis of the literature”. PLOS One. 7 (4): e32960. doi:10.1371/journal.pone.0032960. PMC 3322129. PMID 22496739. ^ a b c d e f Ramey D, Buell D (2004). “A true history of acupuncture” [2017-01-01]. Focus on Alternative and Complementary Therapies. 9 (4): 269–273. doi:10.1211/fact.2004.00244 (inactive 28 February 2019). ^ a b Dorfer L, Moser M, Bahr F, Spindler K, Egarter-Vigl E, Giullén S, Dohr G, Kenner T (September 1999). “A medical report from the stone age?” (PDF). Lancet. 354 (9183): 1023–5. doi:10.1016/S0140-6736(98)12242-0. PMID 10501382. Archived from the original (PDF) on 13 September 2010. ^ a b c Singh S, Ernst E (2008). Trick Or Treatment: The Undeniable Facts about Alternative Medicine. Norton paperback. W. W. Norton. p. 42. ISBN 978-0-393-06661-6. Retrieved 21 July 2015. ^ Robson, T (2004). An Introduction to Complementary Medicine. Allen & Unwin. p. 90. ISBN 978-1741140545. ^ Ramey DW (December 2004). “Inaccurate acupuncture history”. Rheumatology. 43 (12): 1593, author reply 1593–4. doi:10.1093/rheumatology/keh363. PMID 15564643. ^ Epler DC (1980). “Bloodletting in early Chinese medicine and its relation to the origin of acupuncture”. Bulletin of the History of Medicine. 54 (3): 337–67. PMID 6998524. ^ Barnes, 2005, p. 25. ^ Barnes LL (2005). Needles, Herbs, Gods, and Ghosts: China, Healing, and the West to 1848. Harvard University Press. p. 25. ISBN 978-0-674-01872-3. Retrieved 21 July 2015. ^ Barnes, 2005, p. 188. ^ a b Barnes LL (2005). Needles, Herbs, Gods, and Ghosts: China, Healing, and the West to 1848. Harvard University Press. p. 308. ISBN 978-0-674-01872-3. Retrieved 21 July 2015. ^ Barnes LL (2005). Needles, Herbs, Gods, and Ghosts: China, Healing, and the West to 1848. Harvard University Press. p. 58. ISBN 978-0-674-01872-3. Retrieved 14 July 2015. ^ Barnes LL (2005). Needles, Herbs, Gods, and Ghosts: China, Healing, and the West to 1848. Harvard University Press. p. 75. ISBN 978-0-674-01872-3. Retrieved 14 July 2015. ^ Taylor, K (2005). Chinese Medicine in Early Communist China, 1945–63: a Medicine of Revolution. RoutledgeCurzon. p. 109. ISBN 978-0415345125. ^ a b c Beyerstein BL, Sampson W (1996). “Traditional Medicine and Pseudoscience in China: A Report of the Second CSICOP Delegation (Part 1)”. Skeptical Inquirer. Committee for Skeptical Inquiry. 20 (4). Archived from the original on 4 October 2009. ^ Fan, AY (2012). “The first acupuncture center in the United States: an interview with Yao Wu Lee, Washington Acupuncture Center”. Journal of Integrative Medicine. Committee for Journal of Chinese Integrative Medicine. 20 (5). Archived from the original on 27 July 2012. ^ Frum, David (2000). How We Got Here: The ’70s. New York City: Basic Books. p. 133. ISBN 978-0465041954. ^ Singh S (26 March 2006). “A groundbreaking experiment … or a sensationalized TV stunt?”. The Guardian. ^ Singh S (14 February 2006). “Did we really witness the ‘amazing power’ of acupuncture?”. Daily Telegraph. ^ “Acupuncture and moxibustion of traditional Chinese medicine – intangible heritage – Culture Sector – UNESCO”. unesco.org. Retrieved 17 January 2017. ^ a b Xue CC, et al. (April 2008). “Acupuncture, chiropractic and osteopathy use in Australia: a national population survey”. BMC Public Health. 8 (1): 105. doi:10.1186/1471-2458-8-105. PMC 2322980. PMID 18377663. ^ a b Ramsay C (2009). Unnatural Regulation: Complementary and Alternative Medicine Policy in Canada. The Fraser Institute. p. 43. GGKEY:0KK0XUSQASK. ^ Carruzzo P, Graz B, Rodondi PY, Michaud PA (September 2013). “Offer and use of complementary and alternative medicine in hospitals of the French-speaking part of Switzerland”. Swiss Medical Weekly. 143: w13756. doi:10.4414/smw.2013.13756. PMID 24018633. ^ Hopton AK, Curnoe S, Kanaan M, Macpherson H (2012). “Acupuncture in practice: mapping the providers, the patients and the settings in a national cross-sectional survey”. BMJ Open. bmj.com. 2 (1): e000456. doi:10.1136/bmjopen-2011-000456. PMC 3278493. PMID 22240649. ^ a b c d Ishizaki N, Yano T, Kawakita K (December 2010). “Public status and prevalence of acupuncture in Japan”. Evidence-Based Complementary and Alternative Medicine. 7 (4): 493–500. doi:10.1093/ecam/nen037. PMC 2892353. PMID 18955345. ^ a b Samadi DB. “More Americans using acupuncture for common ailments”. Fox News Channel. Retrieved 25 May 2013. ^ Highfield ES, Kaptchuk TJ, Ott MJ, Barnes L, Kemper KJ (September 2003). “Availability of acupuncture in the hospitals of a major academic medical center: a pilot study”. Complementary Therapies in Medicine. Elsevier. 11 (3): 177–83. doi:10.1016/S0965-2299(03)00069-4. PMID 14659382. ^ a b c “Frauen häufiger mit Akupunktur behandelt” (in German). Rheinische Post. Retrieved 25 May 2013. ^ a b Birch S (2007). “Reflections on the German Acupuncture studies” (PDF). Journal of Chinese Medicine (83): 12–17. ^ He W, Tong Y, Zhao Y, Zhang L, et al. (June 2013). “Review of controlled clinical trials on acupuncture versus sham acupuncture in Germany”. Journal of Traditional Chinese Medicine = Chung I Tsa Chih Ying Wen Pan. 33 (3): 403–7. doi:10.1016/s0254-6272(13)60187-9. PMID 24024341. ^ Porter SB (2013). Stuart B. Porter (ed.). Tidy’s Physiotherapy (15 ed.). Churchill Livingstone. p. 408. ISBN 978-0702043444. ^ Hinrichs TJ, Barnes LL (2013). Hinrichs TJ, Barnes LL (eds.). Chinese Medicine and Healing: An Illustrated History (1 ed.). Belknap Press. p. 314. ISBN 978-0674047372. ^ a b c Pybus BE, Cairns CS (1 January 2004). A Guide to AHP Credentialing: Challenges and Opportunities to Credentialing Allied Health Professionals. HCPro. p. 178. ISBN 978-1-57839-478-4. ^ O’Neill, Mark (23 July 2007). “Hong Kong’s traditional Chinese medicine laws ‘putting public at risk‘“. South China Morning Post. ^ Bauer M (1 April 2011). Making Acupuncture Pay: Real-World Advice for Successful Private Practice. Dog Ear Publishing. pp. 42–. ISBN 978-1-4575-0279-8. ^ a b Chan K, Lee H (6 December 2001). The Way Forward for Chinese Medicine. CRC Press. p. 349. ISBN 978-1-4200-2423-4. ^ a b WHO Global Atlas of Traditional, Complementary and Alternative Medicine. World Health Organization. 2005. p. 195. ISBN 978-92-4-156286-7. Deadman P, Baker K, Al-Khafaji M (2007). A Manual of Acupuncture. Journal of Chinese Medicine Publications. ISBN 978-0951054659. Jin G, Jin JX, Jin LL (2006). Contemporary Medical Acupuncture – A Systems Approach. Springer. ISBN 978-7040192575. Ulett GA (2002). “Acupuncture”. In Shermer M (ed.). The Skeptic Encyclopedia of Pseudoscience. ABC-CLIO. pp. 283 ff. ISBN 978-1-57607-653-8. William FW, ed. (2013). “Acupuncture”. Encyclopedia of Pseudoscience: From Alien Abductions to Zone Therapy. Routledge. pp. 3–4. ISBN 978-1-135-95522-9.